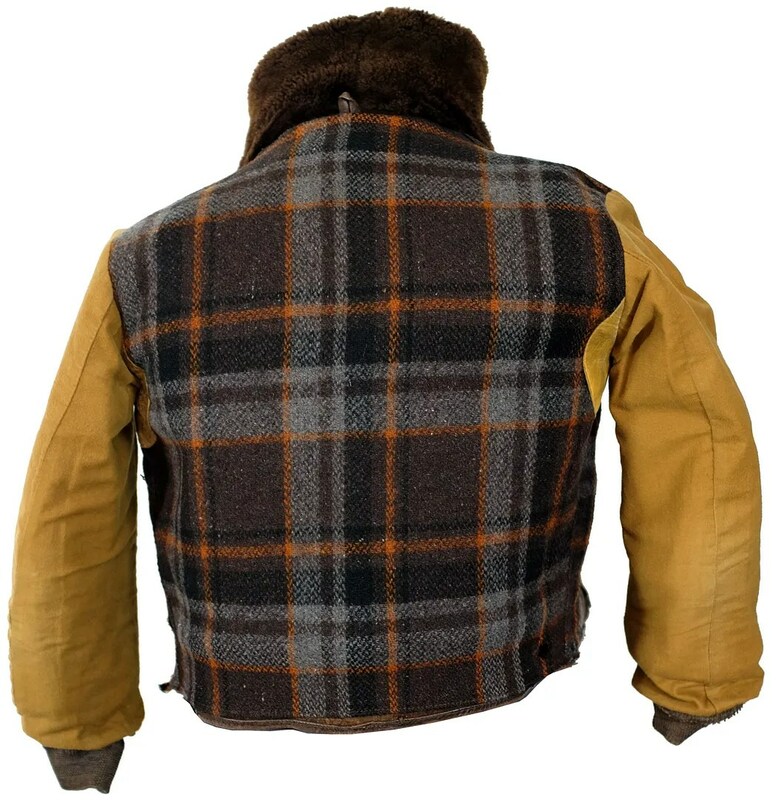 This vintage jacket was made in Milwaukee, Wisconsin by Fried Ostermann between 1936 and 1938 under the Albert Richard Sportswear label. 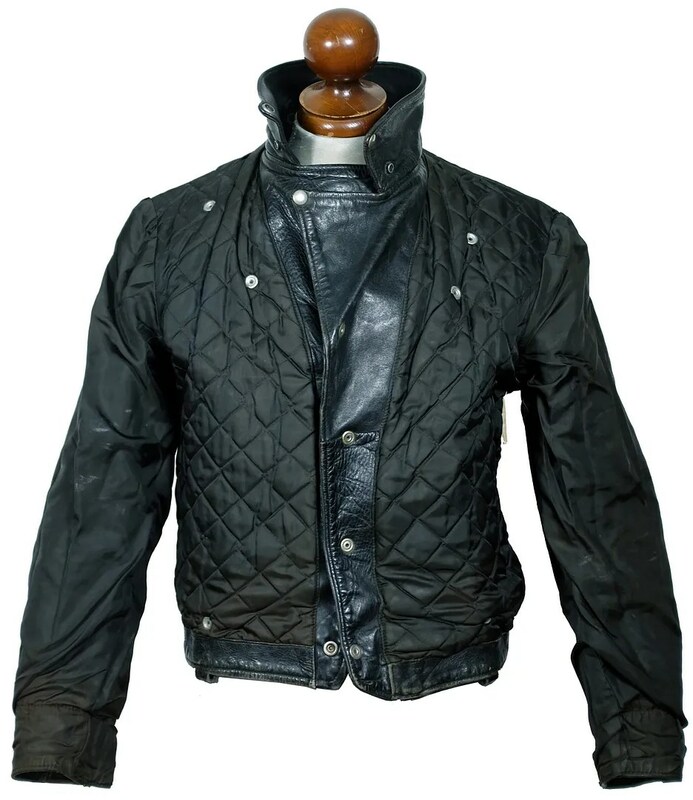 The jacket is made of front quarter horsehide leather, with mouton panels and collar. 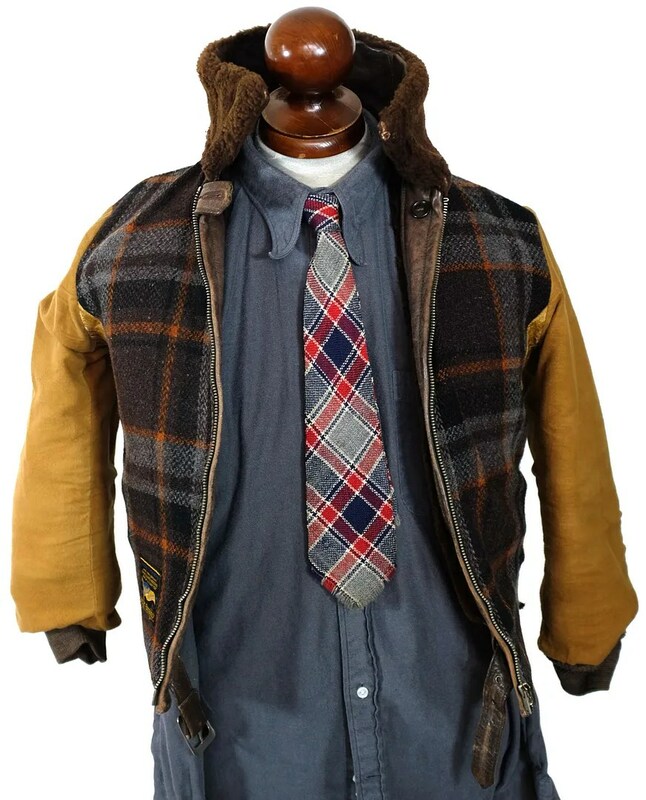 Originally sold as a “Laskinlamb jacket”, this style has come to be known by collectors as the Grizzly. 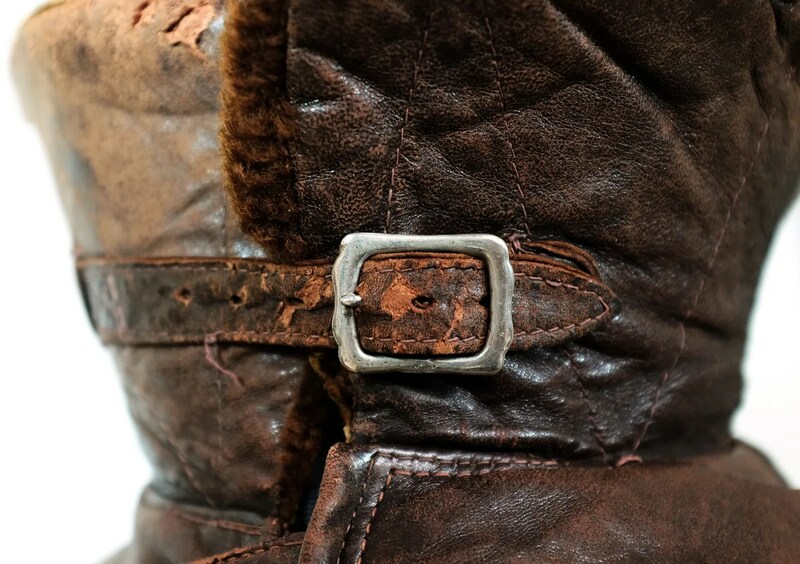 These were popular in the mid to late 1930. 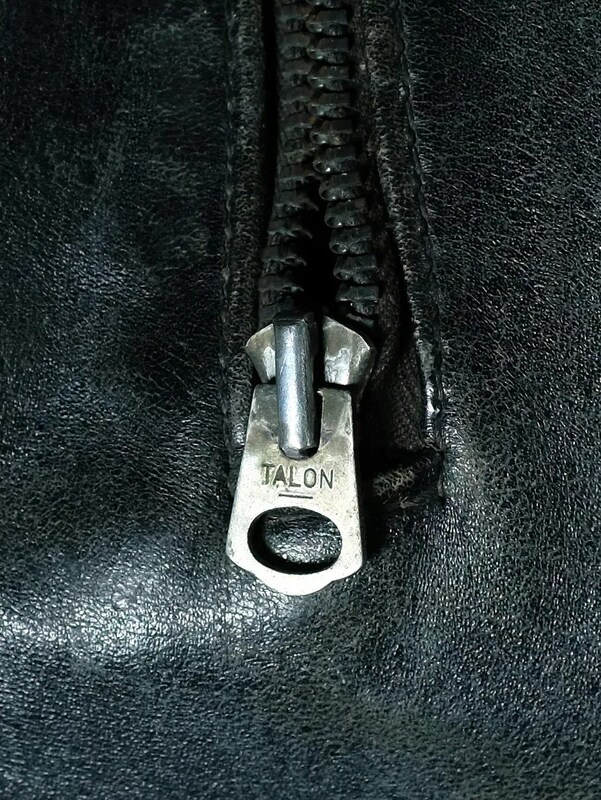 The jacket has a Talon main zipper with a grommet style stopbox. 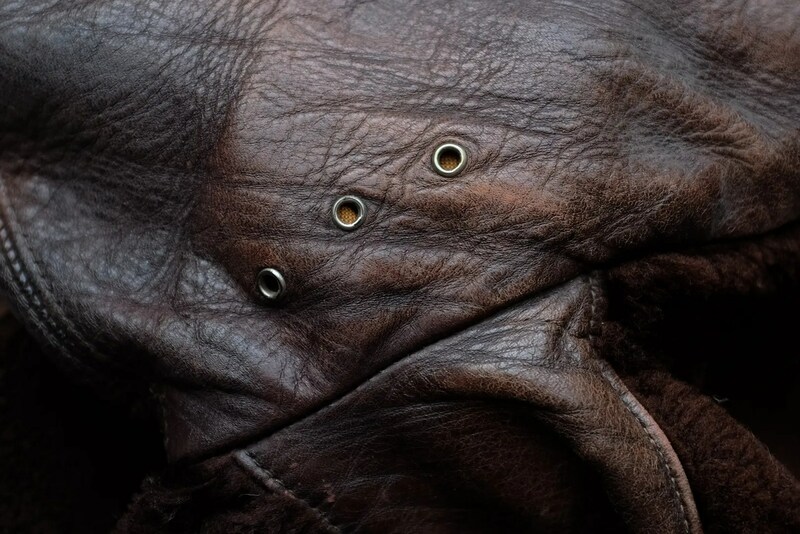 The slider is of the deco sunburst design with oval slider-to-puller connection, which was only produced in the mid 1930s and which was replaced by a simpler design around 1938. 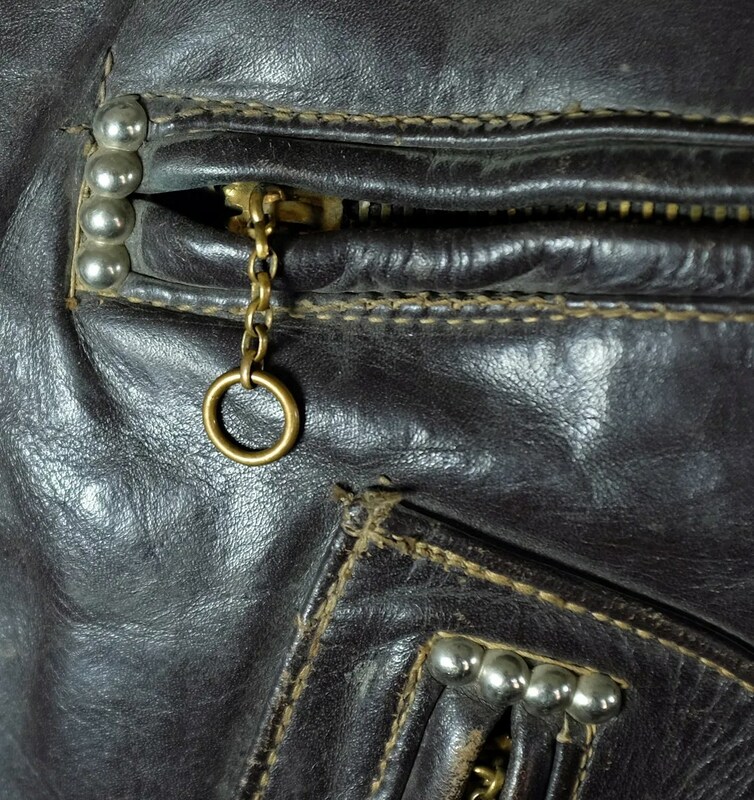 The pull is a rectangular holed, plain backed version, also typical of mid 1930s production. 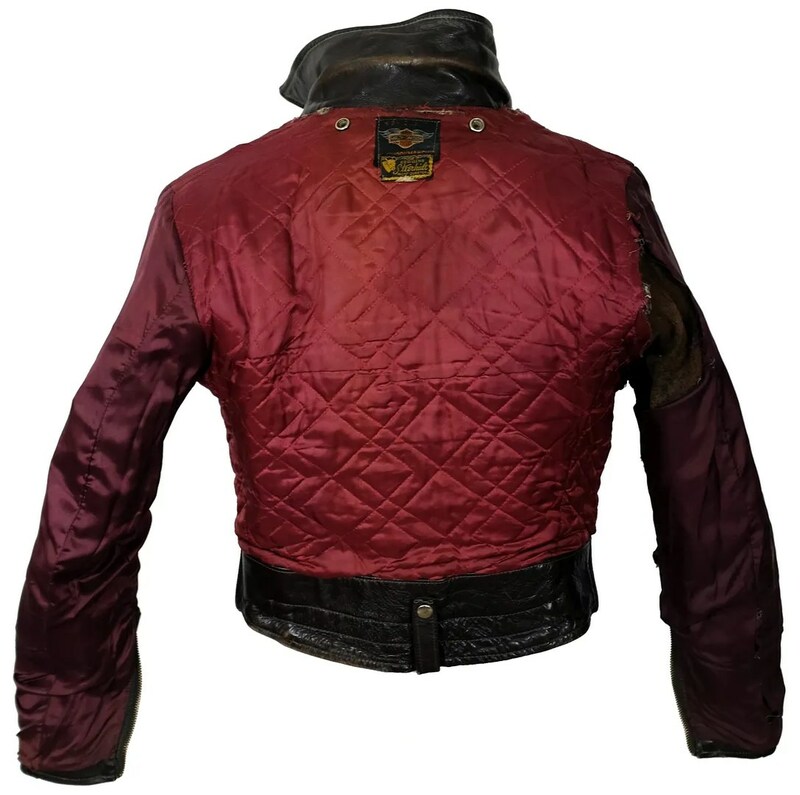 The jacket is lined with plaid wool, with leather pit guards and ventilation grommets. The sleeves have knit storm cuffs to keep out the wind. 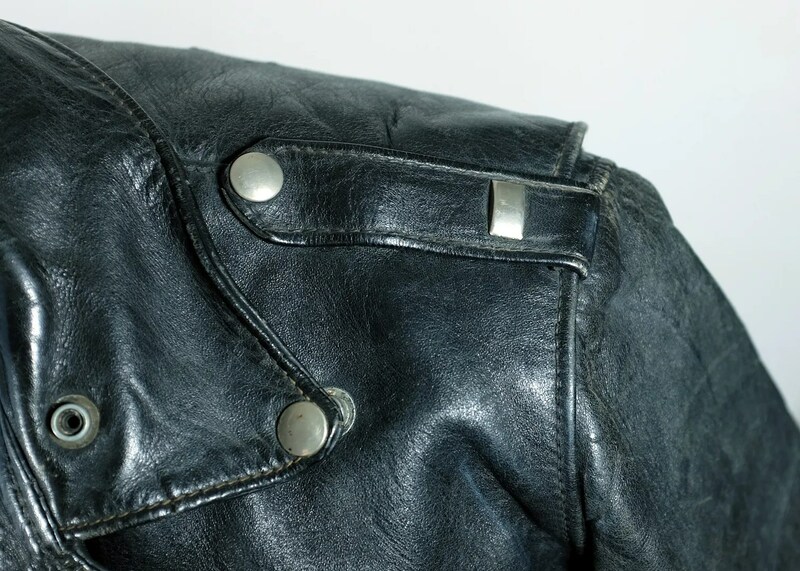 A history of Albert Richard which I wrote for “The Art of Vintage Leather Jackets”: Fried-Ostermann was founded c.1902 as a glove manufacturer. 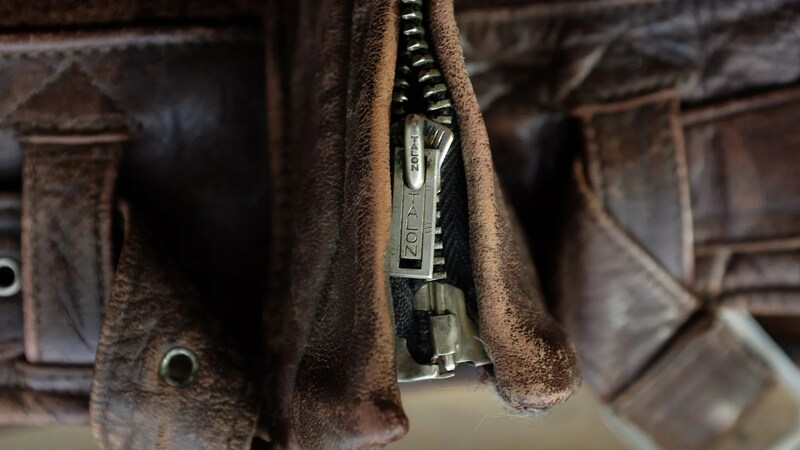 They bought out their competitor, Price Gloves, and relocated production of that company’s products to their original factory, located at 617-645 Reed Street, Milwaukee, WI. 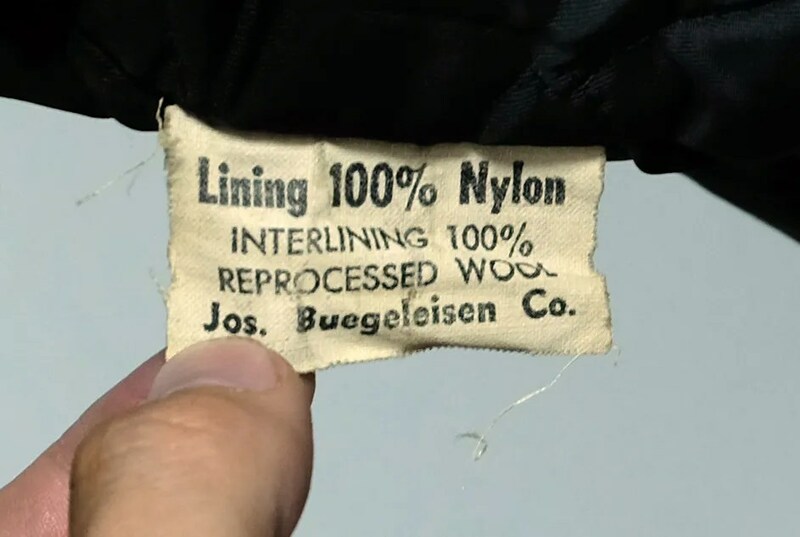 By 1915, the company had gained a partner, and was known as the Fried, Ostermann, Meyer Co, but that looks to only have lasted until 1917. As the company grew, they relocated to 1645 S. 2nd Street, Milwaukee, WI. 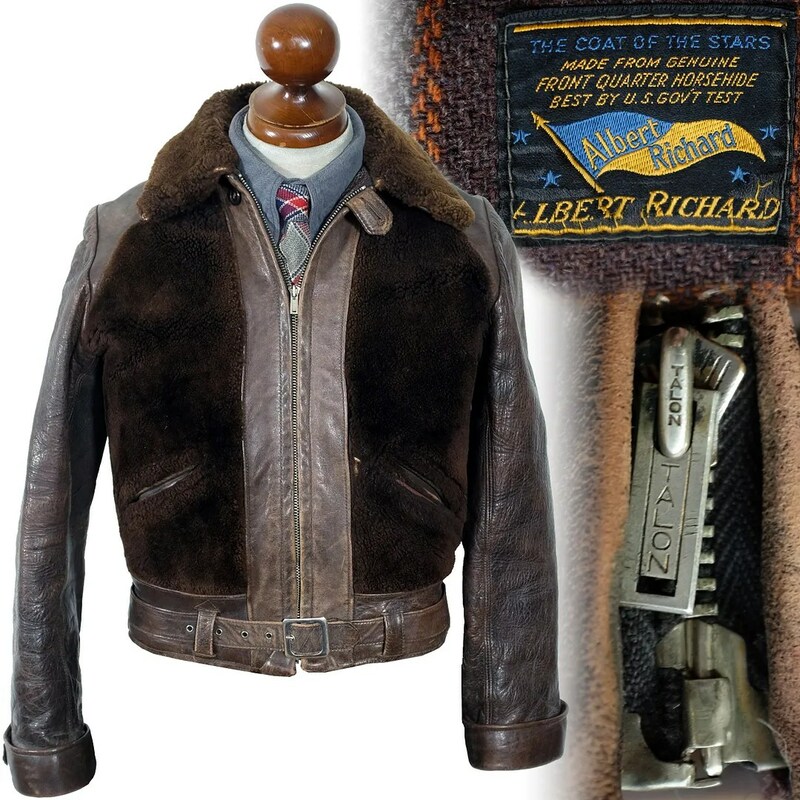 Fried-Ostermann diversified out of gloves and into outerwear in the late 1920s with the formation of a new division of the company, called Albert Richard. 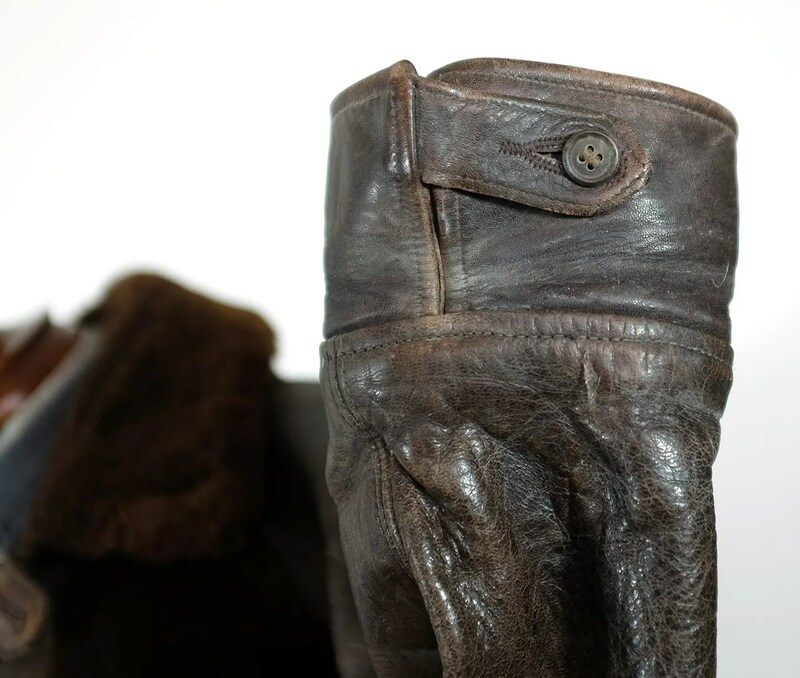 The leather jackets, mackinaws, overcoats and sportswear produced by Albert Richard would soon come to eclipse the glove-making side of the company. Pre-war advertising stressed health and sports, with endorsements from college football players. 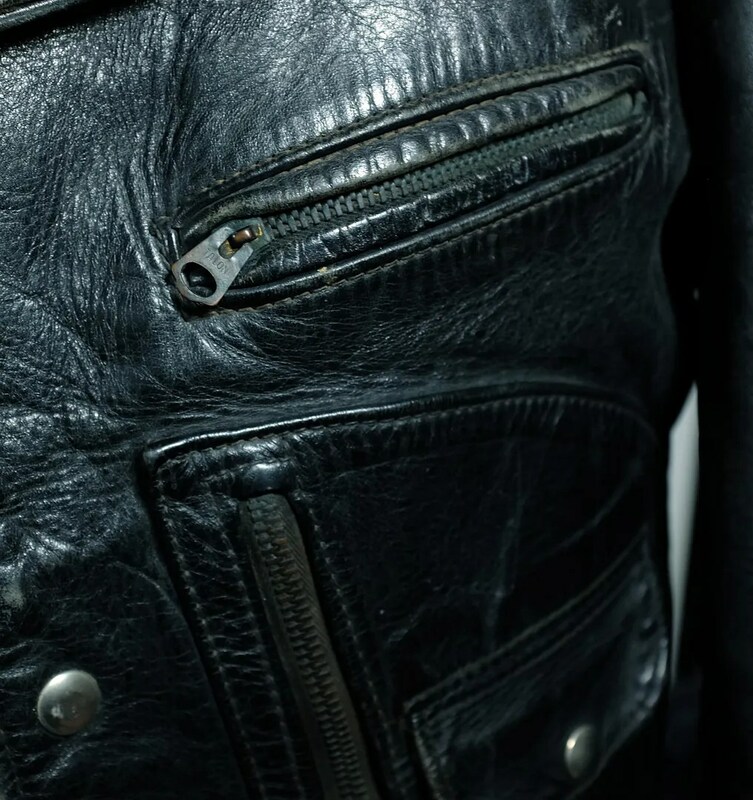 These ads also talk about bringing items of clothing which were previously thought of as workwear, like mackinaws and leather jackets, into the realm of ordinary streetwear, citing their comfort and durability. 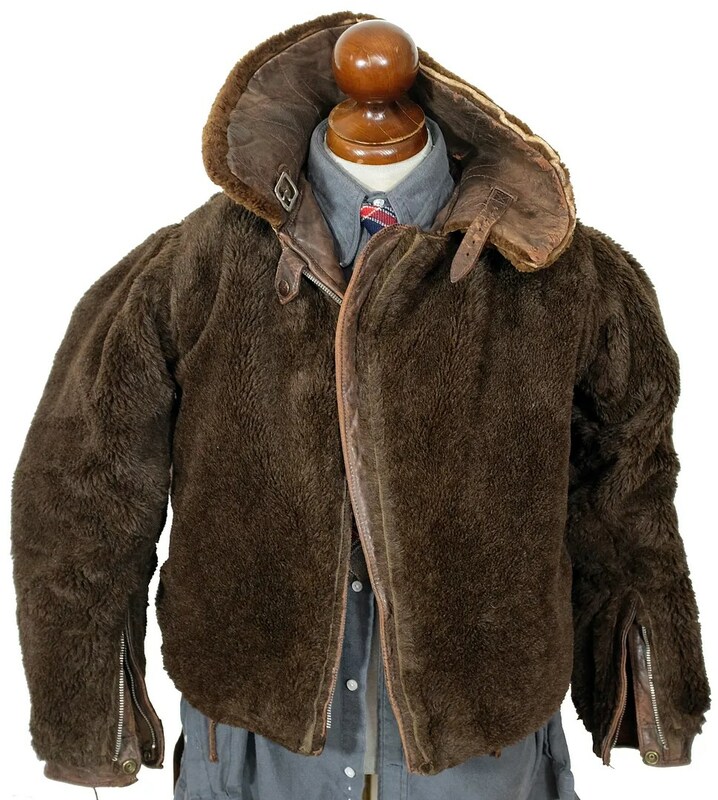 During WWII, the Albert Richard factory made A-2 (contract AC 23383), M-422A (contract 1406A), M444A and M445A flight jackets under the name of their parent company, Fried-Ostermann. 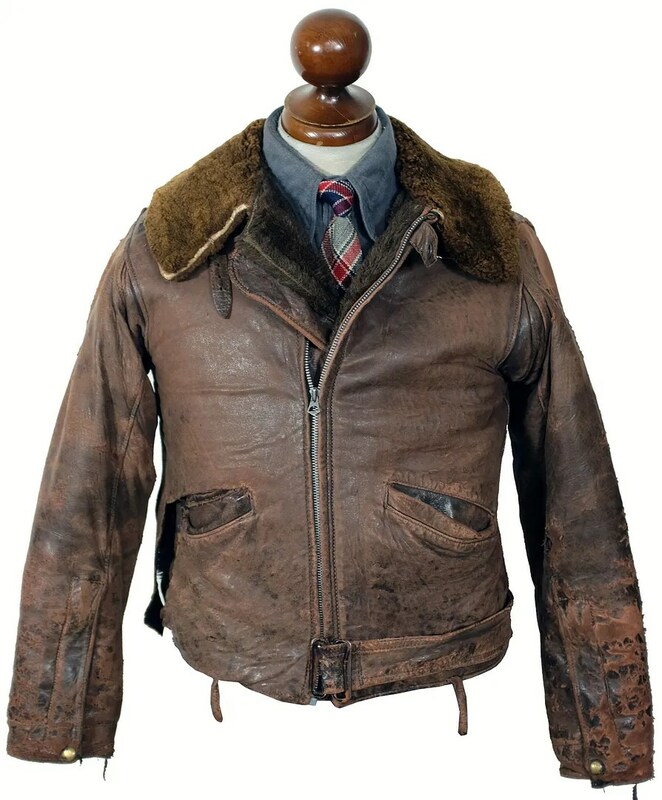 They advertised leather jackets, overcoats and sportswear heavily during WWII, giving their jackets model names like the “Spitfire” and the “Meteor”. During the war, the company gave away wall-sized posters showing a range of american military airplanes. 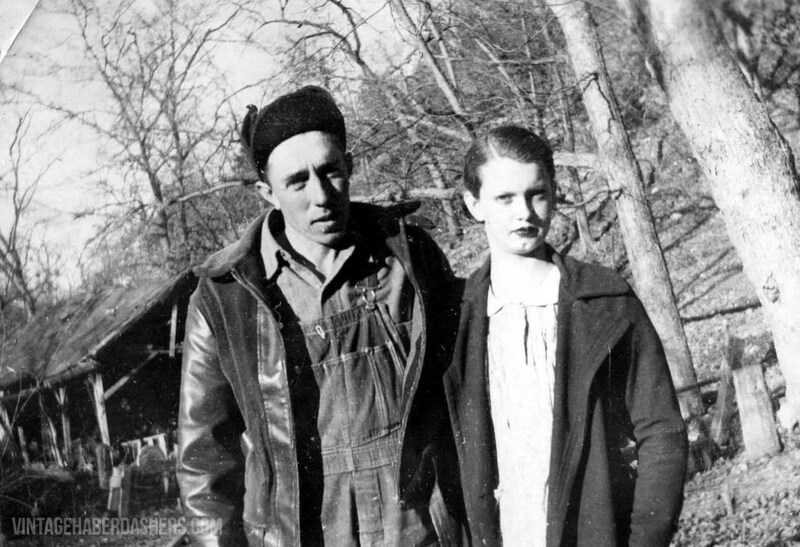 850 workers were employed by Albert r in 1946, with plans to hire another 400. 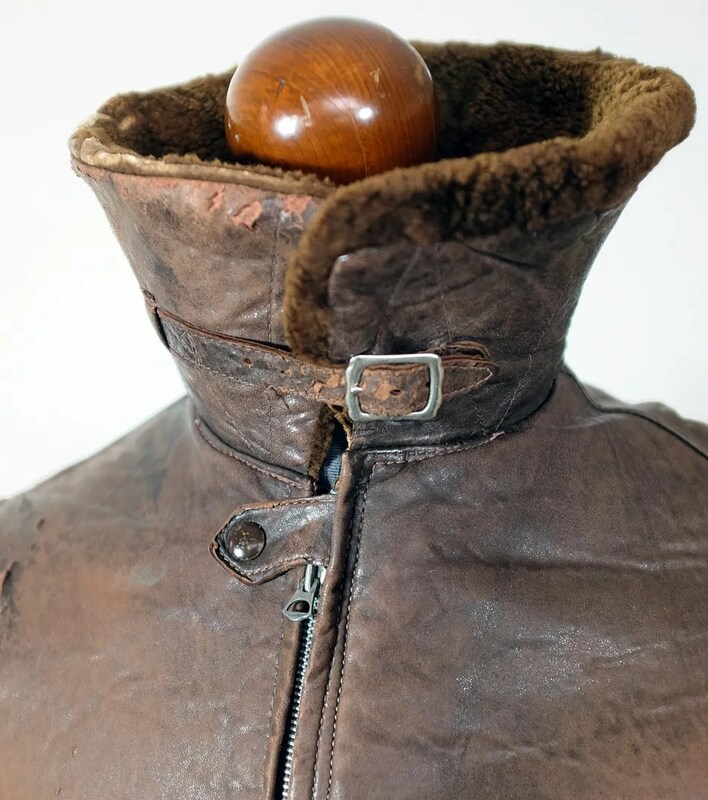 The company was one of the first to use fiberglass insulation in coats, a technology borrowed from b-29 bombers Sheepskin collared “storm coats” became a signature model after the war. President of Fried-Ostermann, Richard Fried, sold their Albert Richard Division to the Drybak corporation of Binghampton, NY in late 1952. 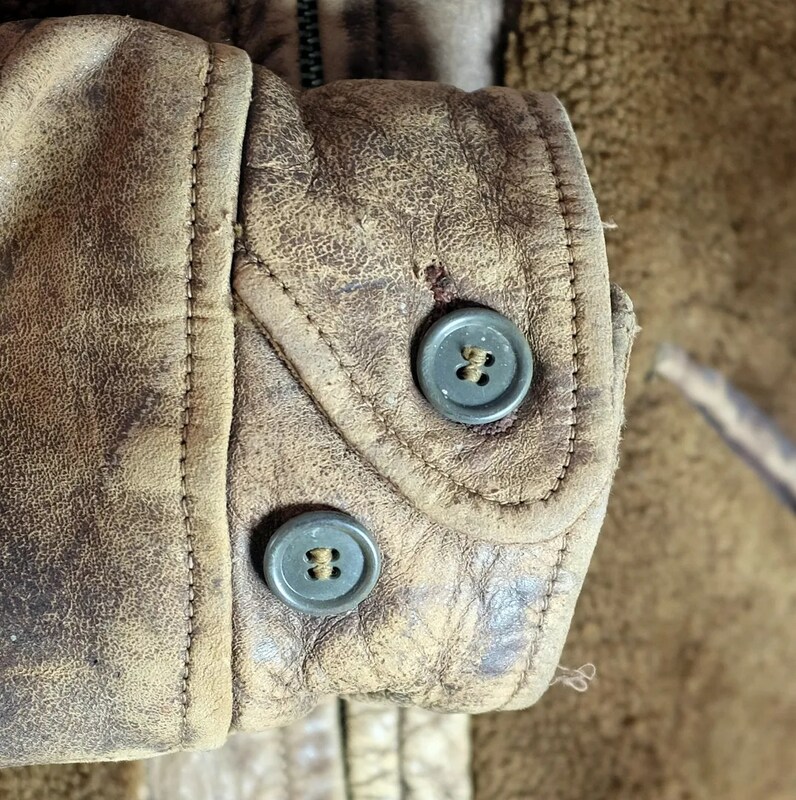 Drybak, a maker of canvas hunting clothing was looking to diversify their line. 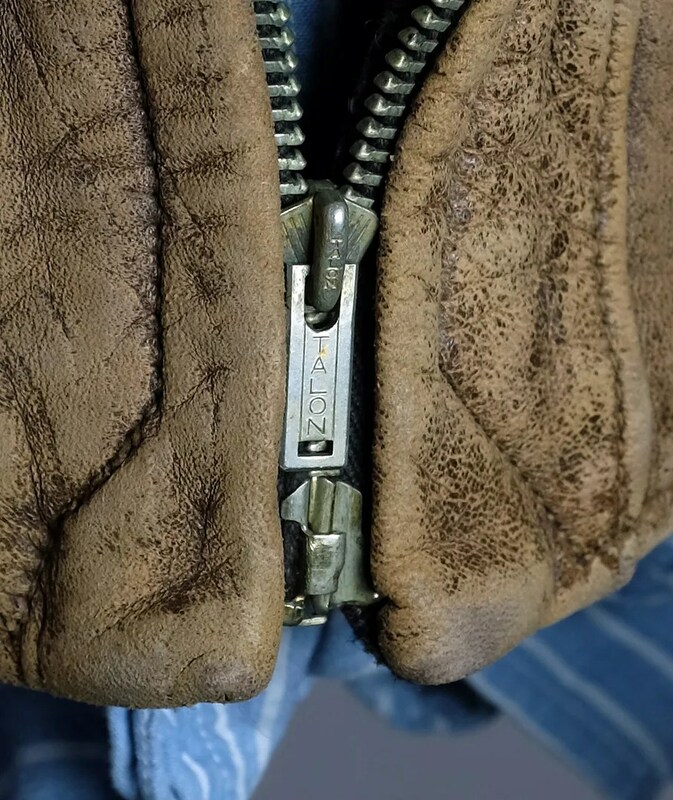 In the deal, they got the licensing, branding, patterns, dealership network, but other than the Vice President and designer for Albert Richard, all of the employees and equipment stayed at the plant in Milwaukee. 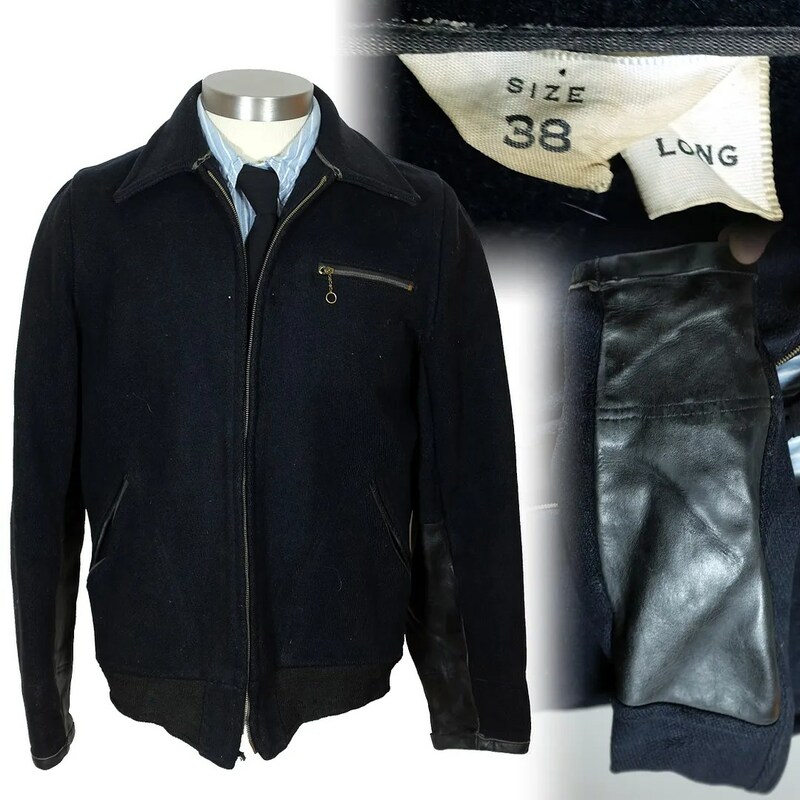 Fried-Osterman re-focused the attention of their plant on the production of gloves, and on producing leather jackets under house labels for mail order and department stores. 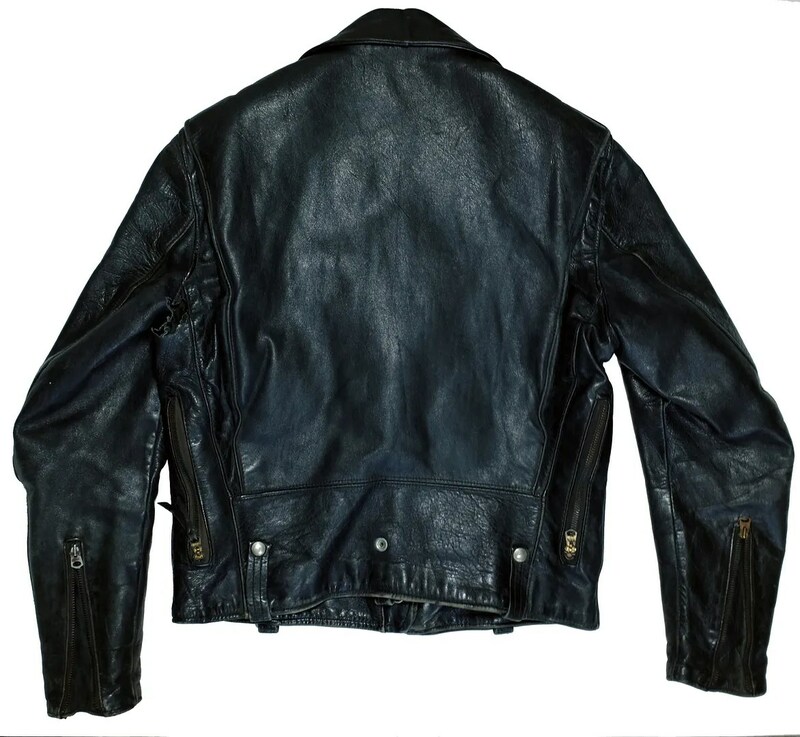 Starting in 1953, under Drybak’s ownership, Albert Richard clothing was once again produced, this time under contract at a factory in New Jersey, which Drybak declined to name. 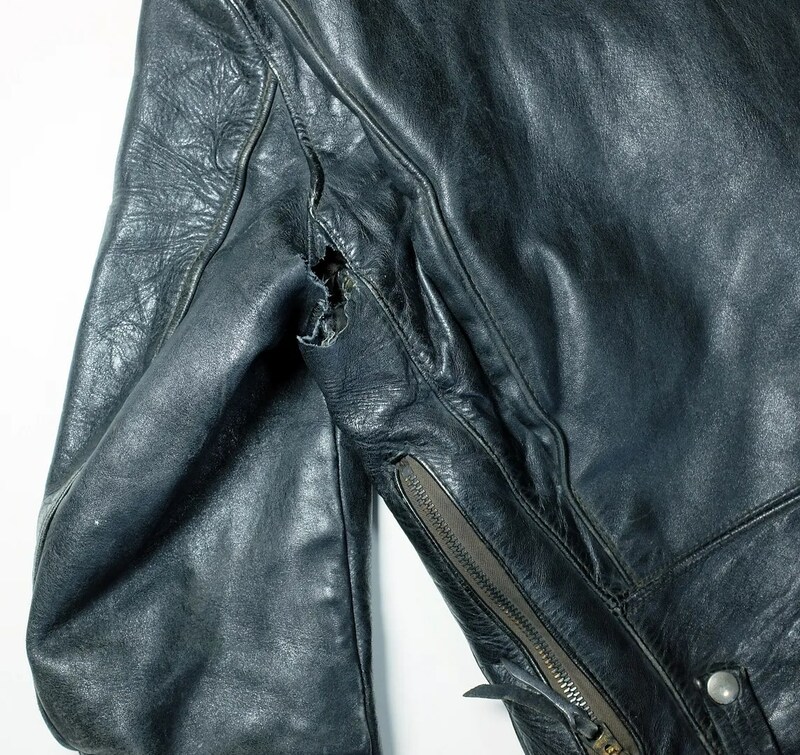 The plan at that time was to have production moved to New York by 1954. 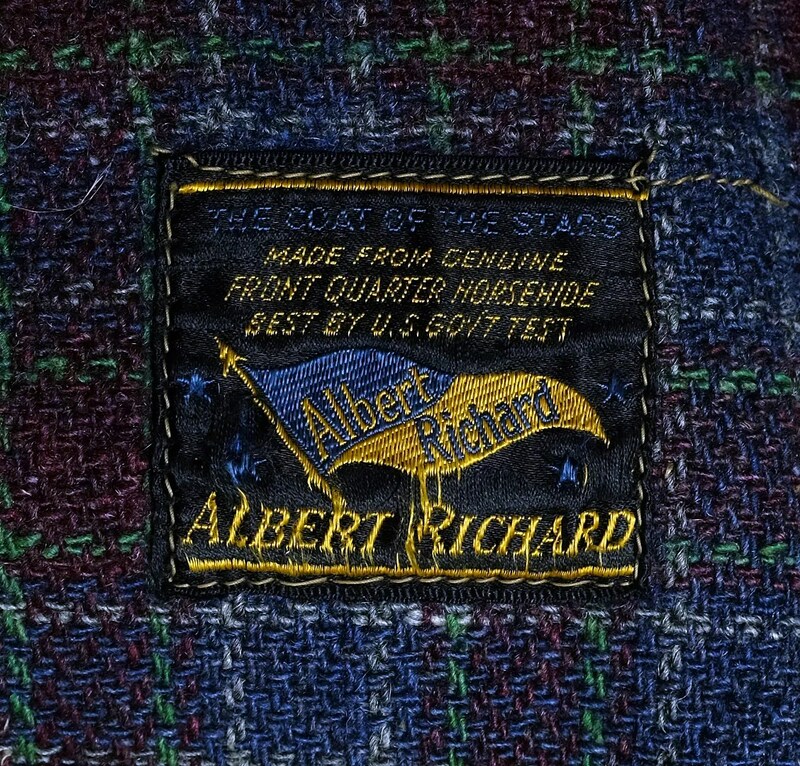 Labels were changed in this period to read “Albert Richard by Drybak”. 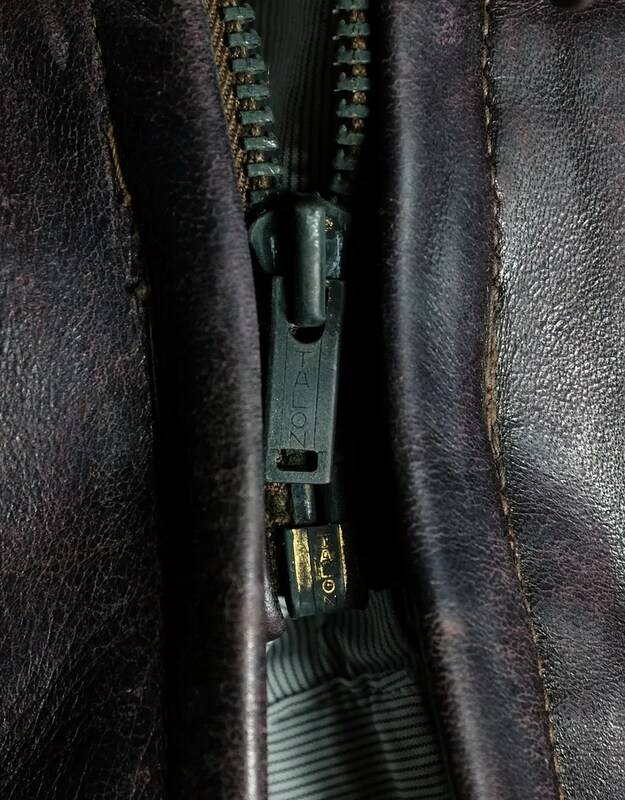 In 1955, Drybak acquired the Martin Mfg. Co. in Martin, TN. 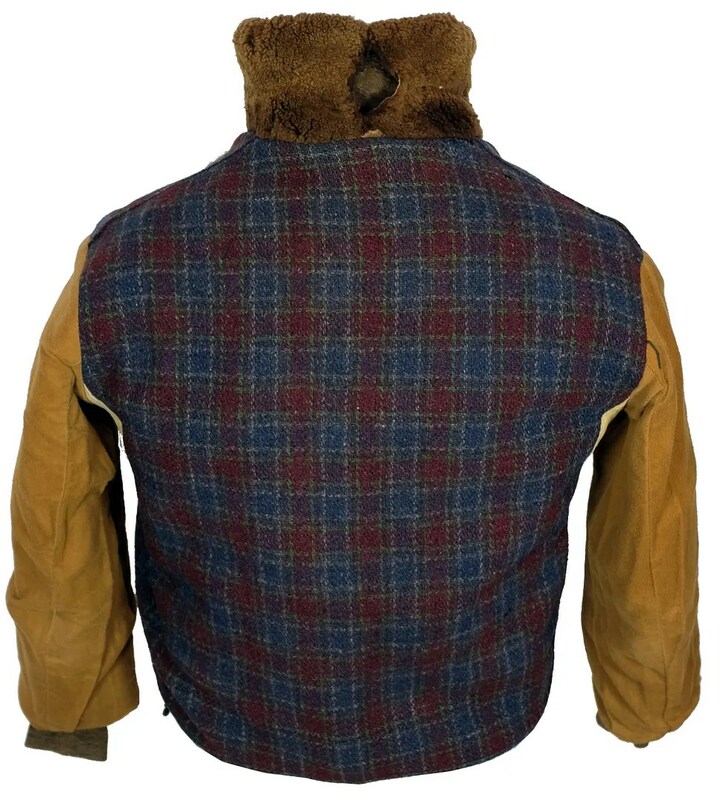 They closed their Binghamton operations in that same year and relocated their hunting clothing manufacturing and their Albert Richard division to the Tennessee plant to take advantage of the lower labor costs in the south. 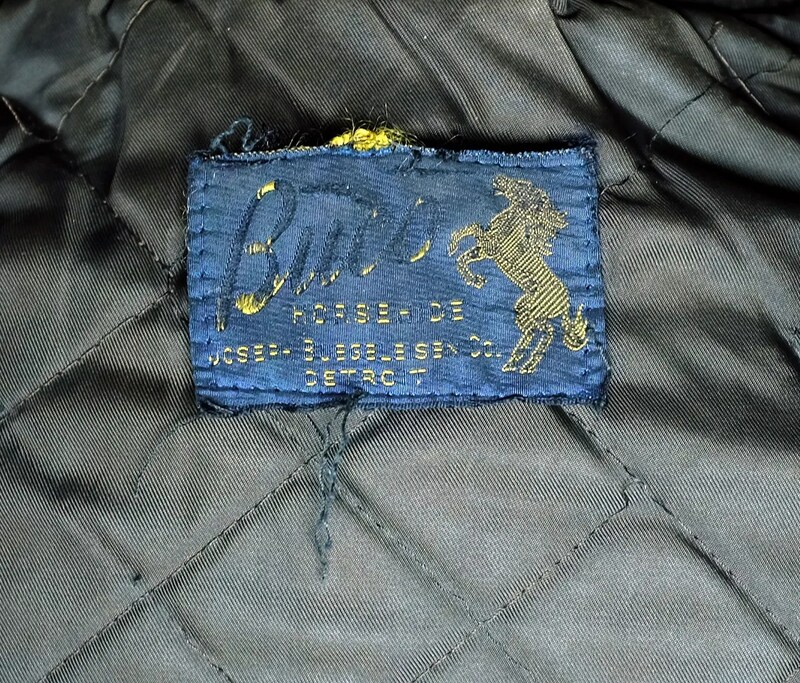 This vintage work jacket was made immediately after WWII. 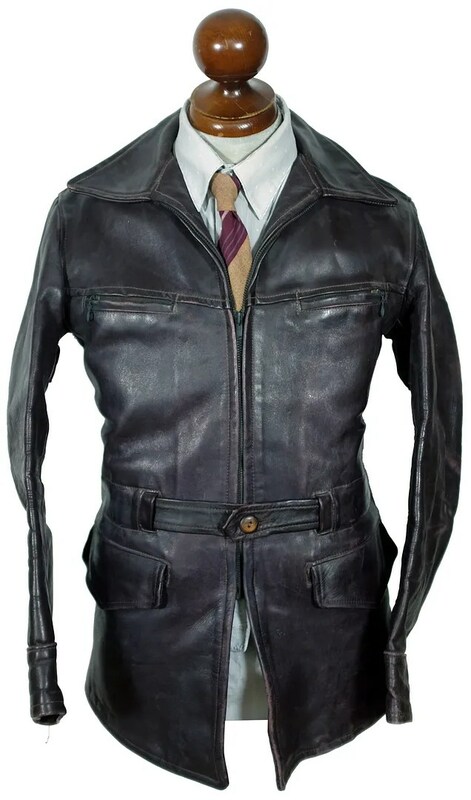 It is made of mackinaw wool, with leather cuff, sleeve and pocket details, typical of work jackets designed for railroad workers. 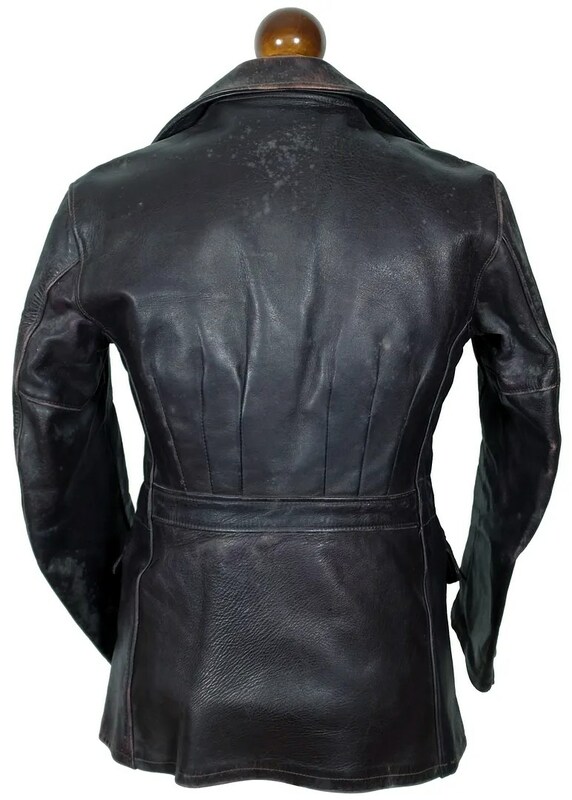 The jacket has a Crown zip, knit waistband and is unlined. 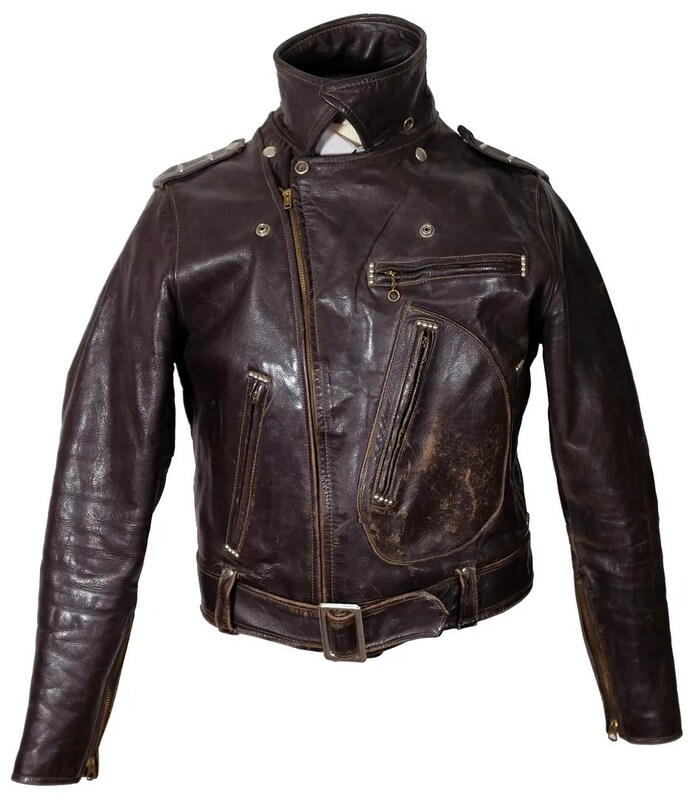 This vintage jacket was made in the 1950s and was sold by Harley Davidson Motor Cycles. 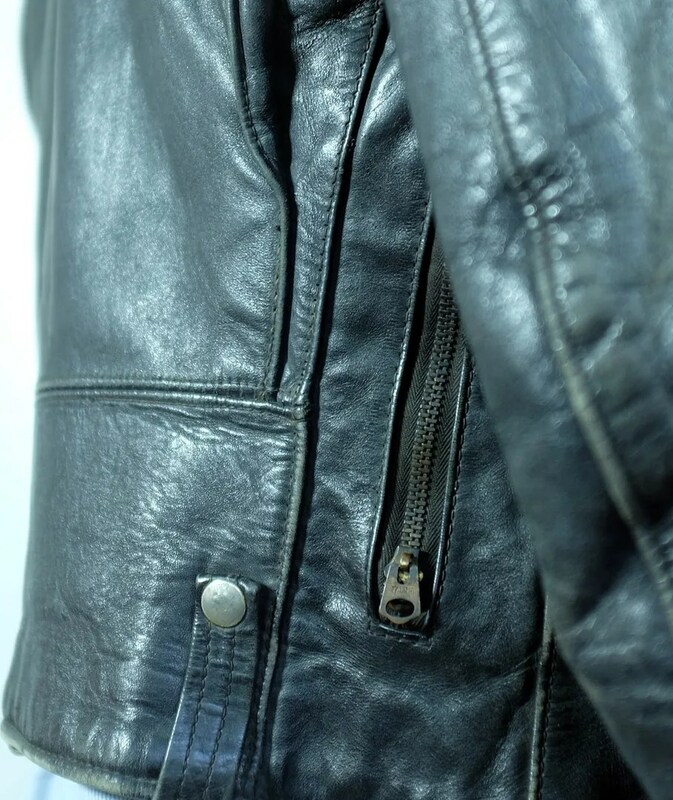 It is made of genuine Front Quarter Steerhide leather. 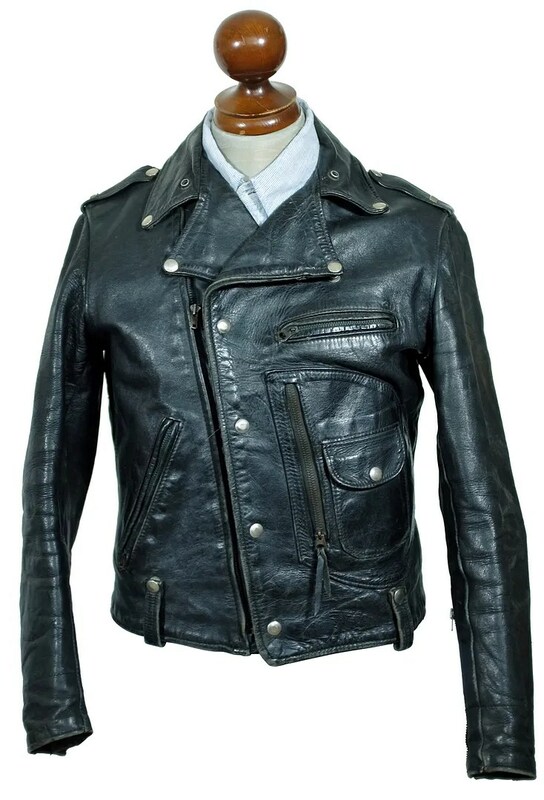 The jacket has an asymmetrical motorcycle jacket cut, with a D pocket, zipped breast pocket, zipped side pockets, open zip cuffs and epaulettes. 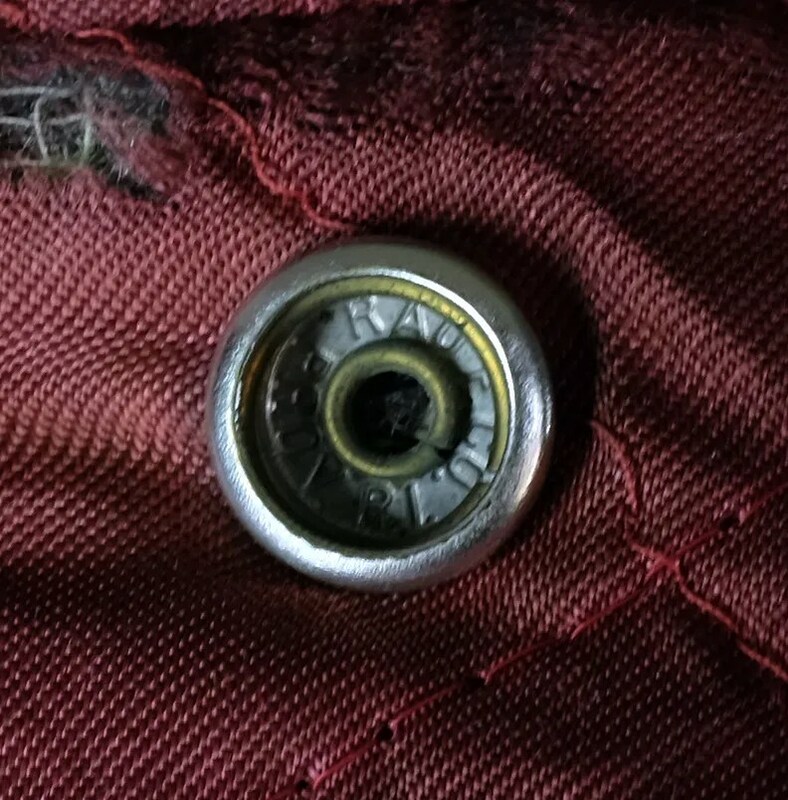 The ends of all the pockets are trimmed and reinforced with four nickel studs. 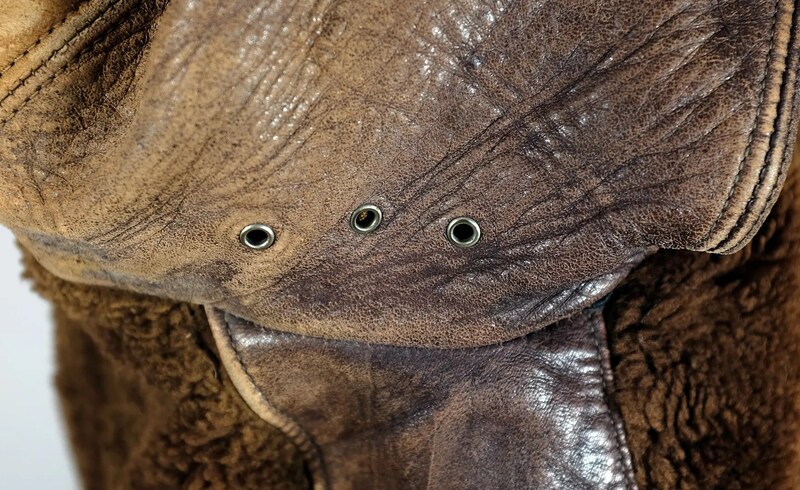 That is doubled on the epaulettes. 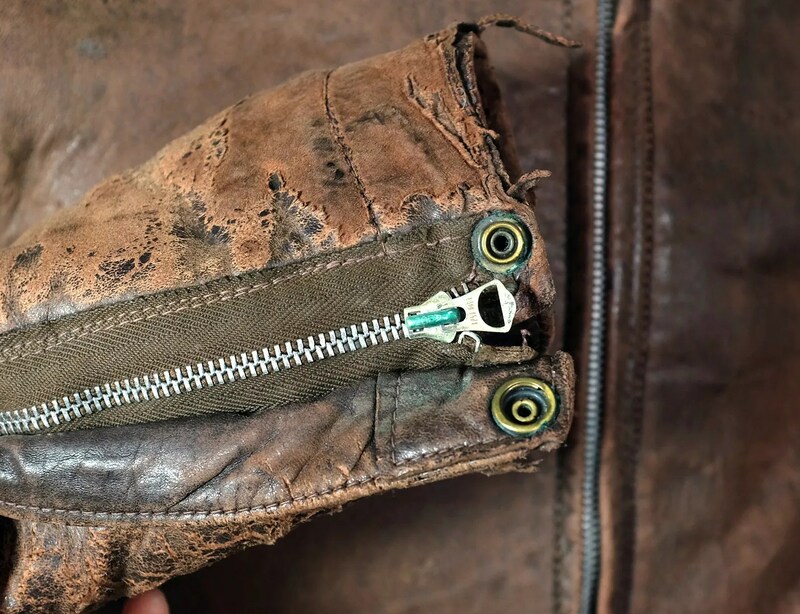 The jacket has a quilted lining, and Serval zippers throughout. 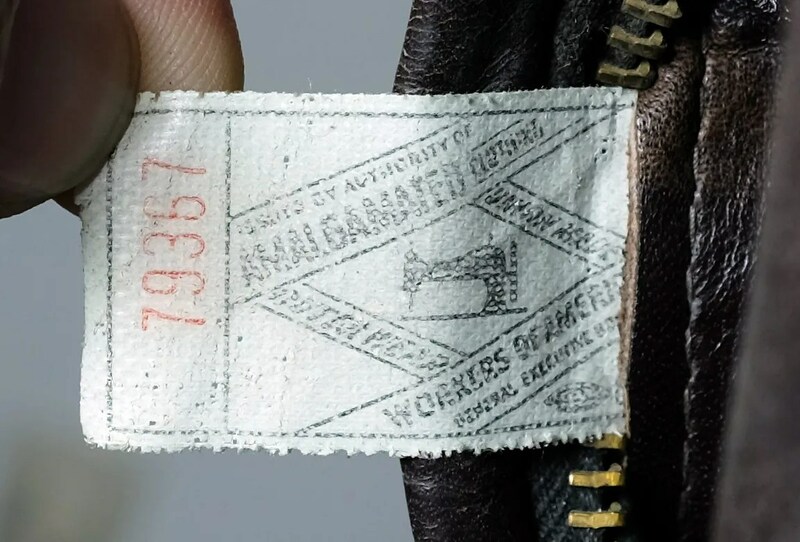 It bears a 1949 Amalgamated Clothing Workers of America union label of the variant used from 1949-1962. 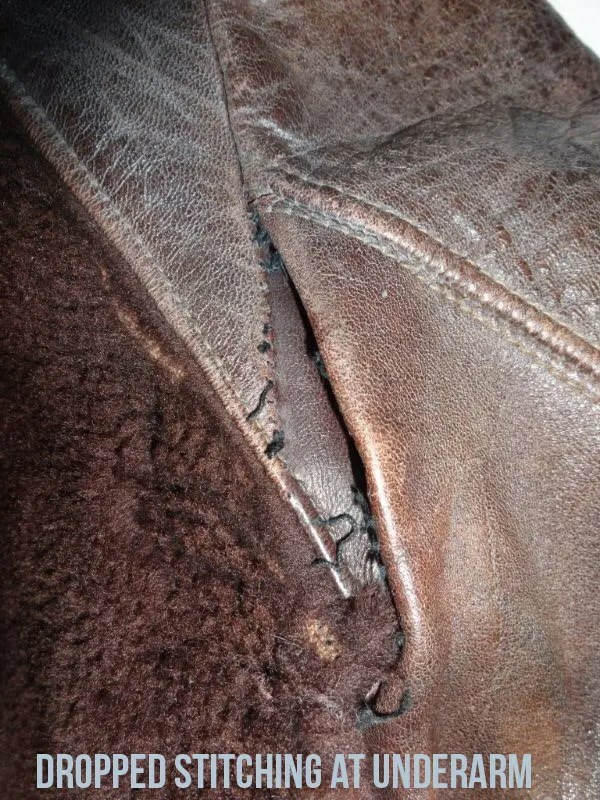 The jacket is a dark seal brown. 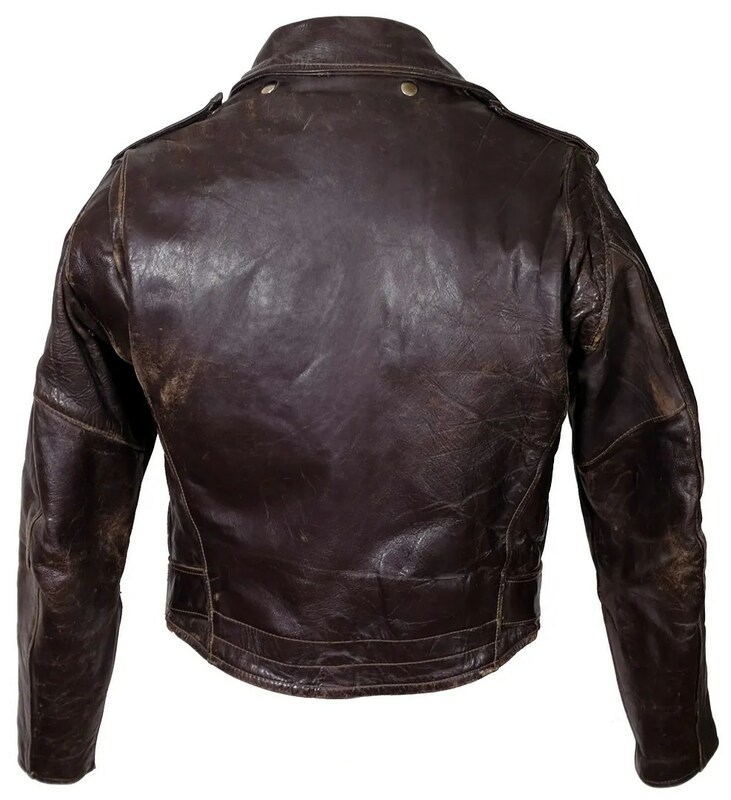 This vintage jacket was made in the early 1950s in Detroit, Michigan by the Joseph Buegeleisen Company (Buco) out of horsehide. 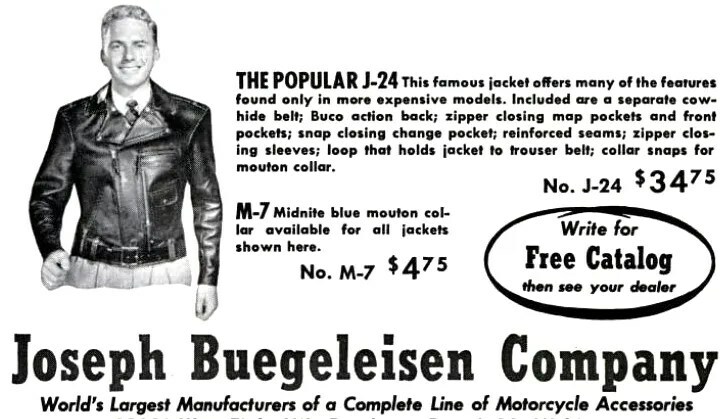 It is their J-24 D-Pocket model motorcycle jacket. 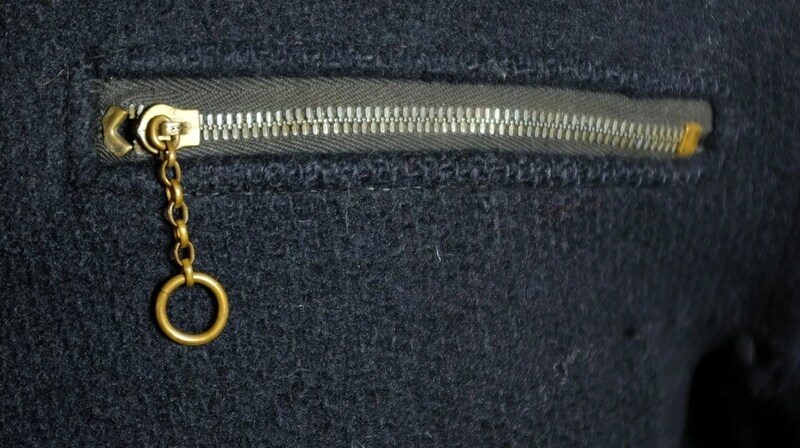 From the style of stop box on the main zipper, with its wide ribs, but without the Talon name, this one was made between about 1952 and 1957. 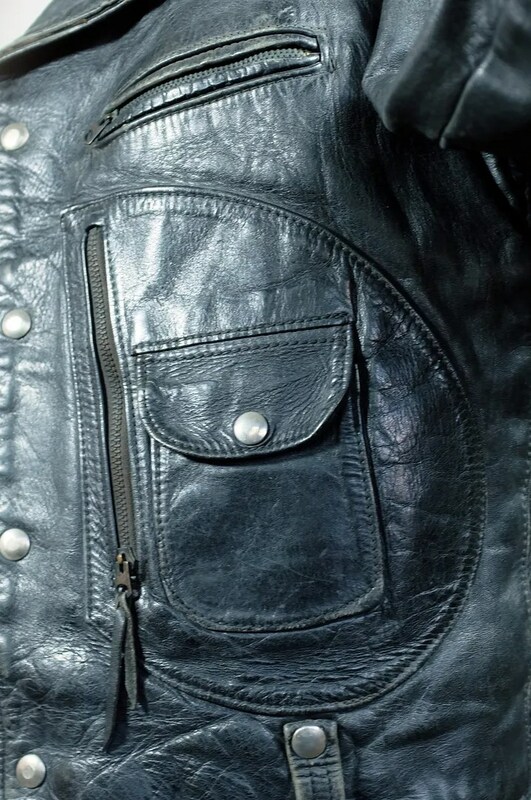 The jacket has a D-pocket map pocket with a rounded cornered cigarette pocket. 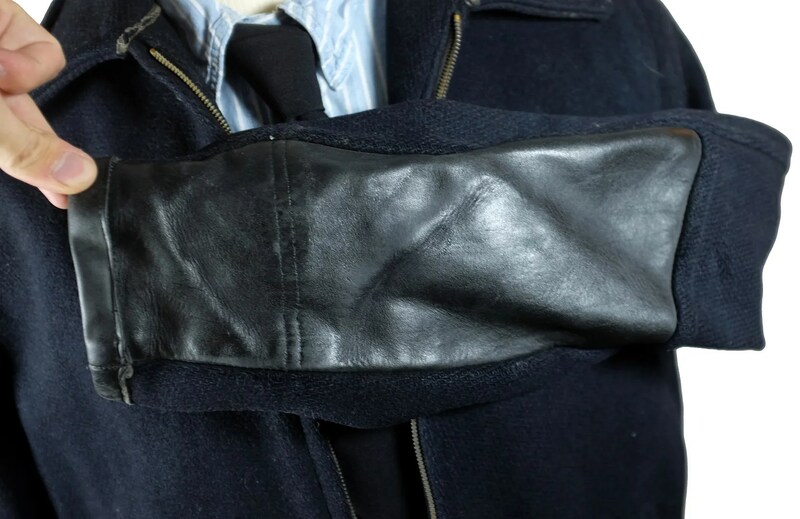 It has zipped sleeves, snapped lapels, snapped belt loops for an external belt, bars on the epaulettes, zippered side storage, a handwarmer pocket, and bi-swing shoulders. 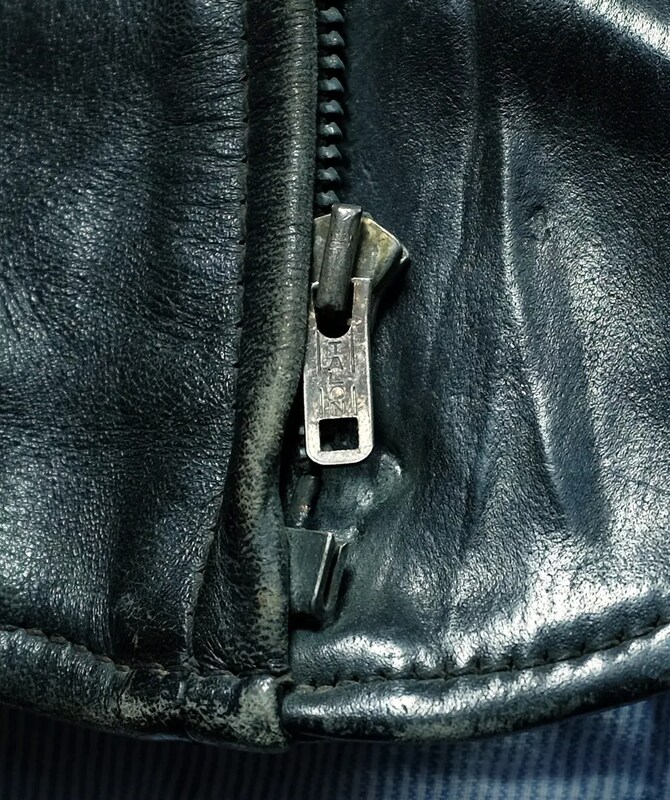 At some point, it appears the original owner either broke the main zipper or gained weight, and added snaps, which are offset from the original zip position. 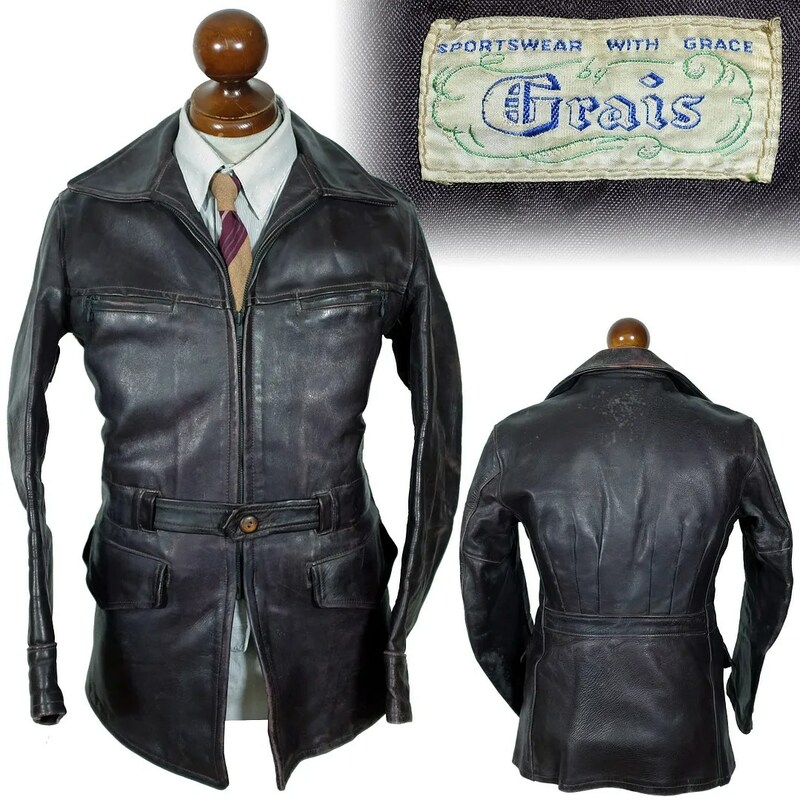 This vintage leather jacket was made by by Grais – Sportswear with Grace in the 1940s. 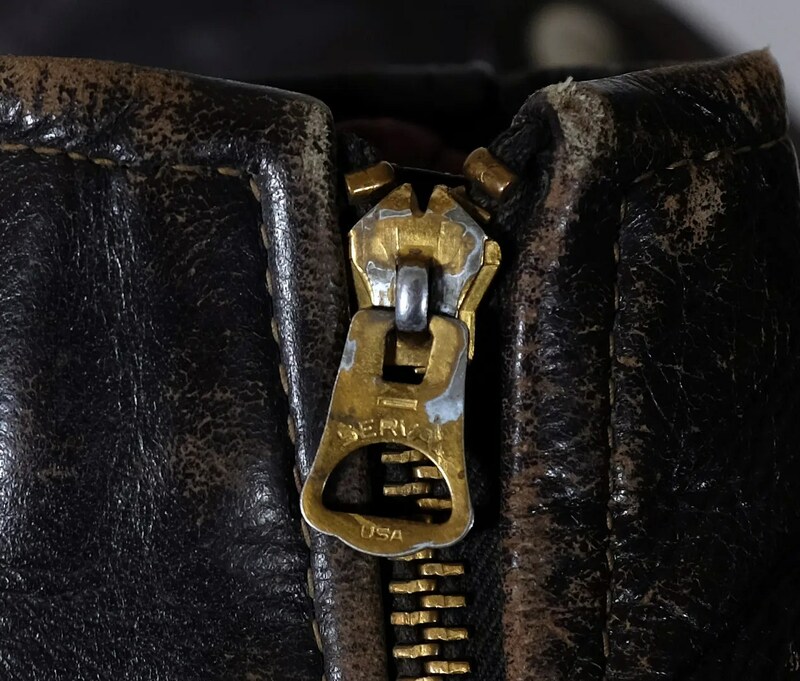 It has a half-belt, pleated back, a surcoat length cut, a tunneled, elasiticized belt with a single button closure, a blacked out Talon of mid-late 1940s manufacture, and ring pull chain zippers on the dual breast pockets. 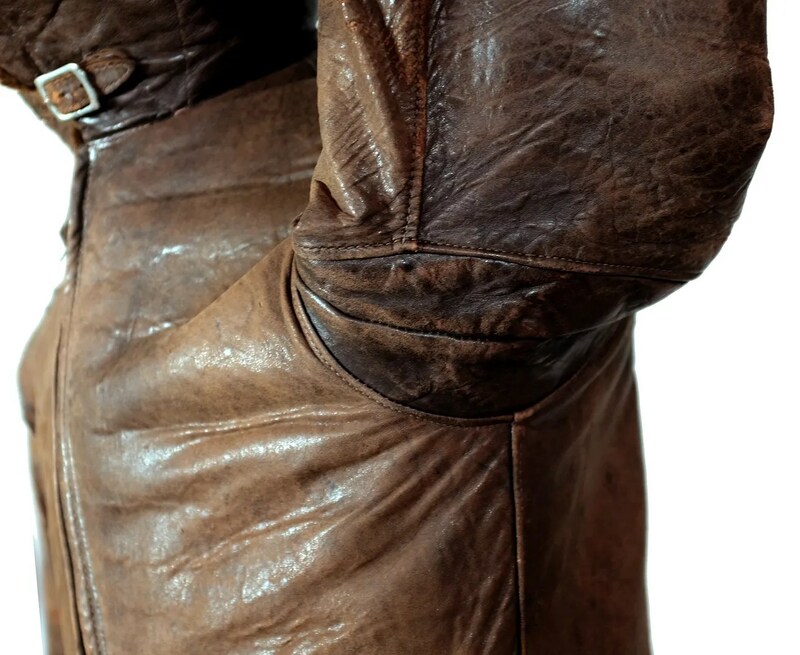 The cargo pockets are flapped and there are buttons on the cuffs. 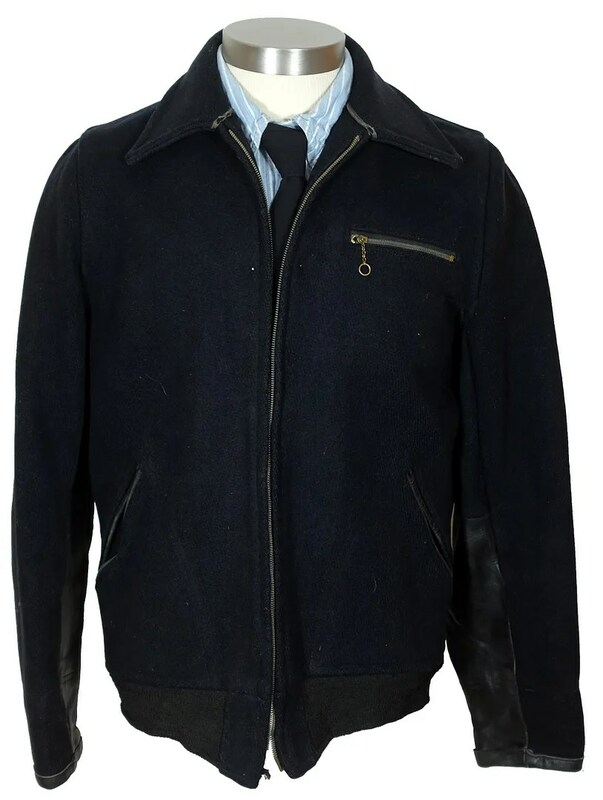 This vintage jacket was made in Milwaukee, Wisconsin by Fried Ostermann between 1936 and 1938 under the Albert Richard Sportswear label. 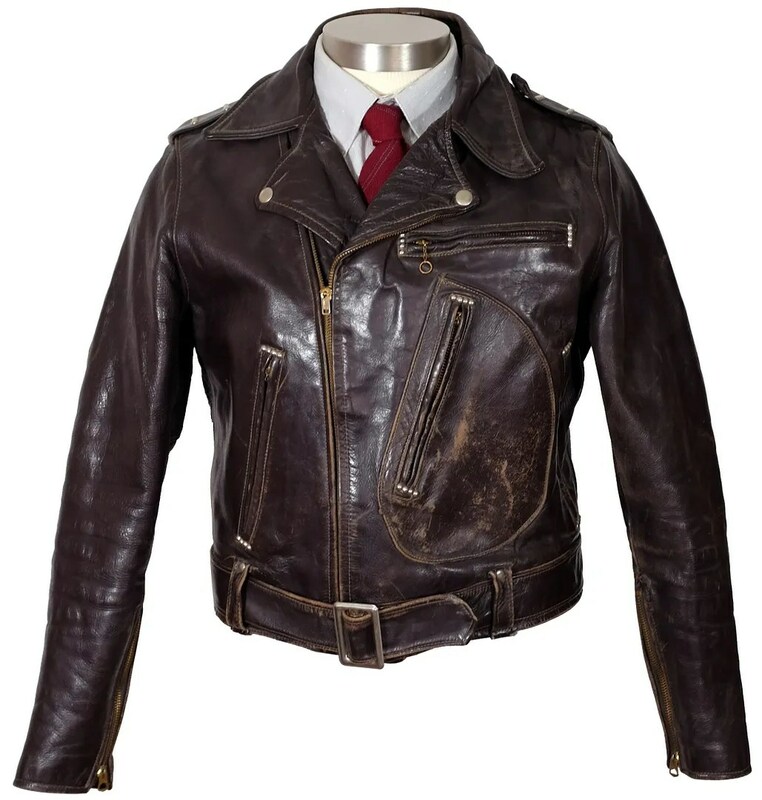 The jacket is made of front quarter horsehide leather, with mouton panels and collar. 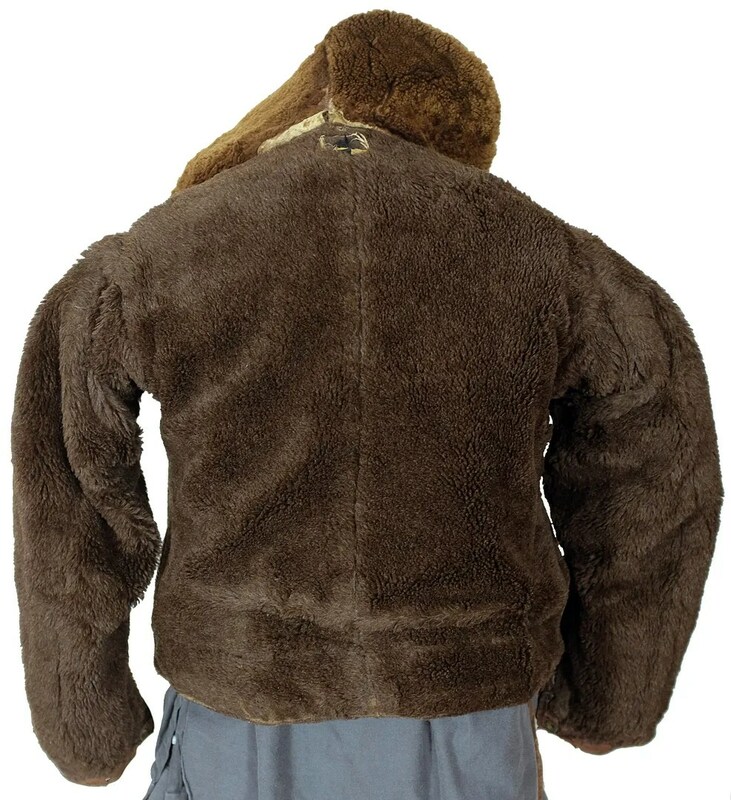 Originally sold as a “Laskinlamb jacket”, this style has come to be known by collectors as the Grizzly. 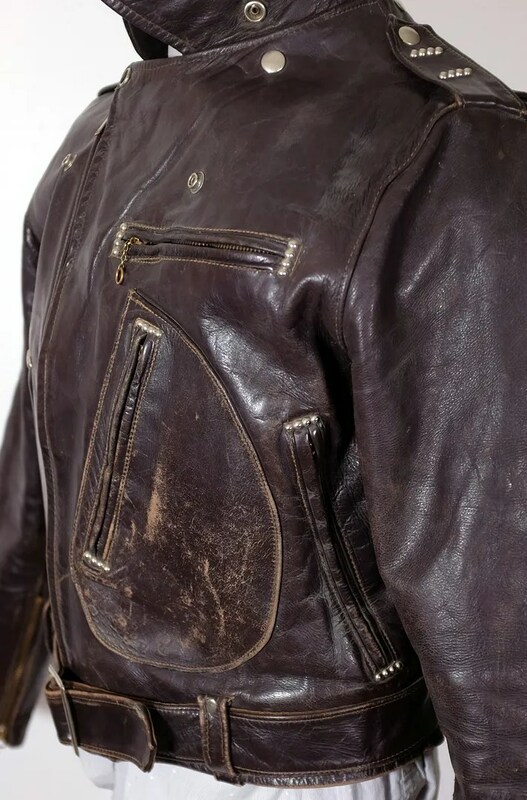 These were popular in the mid to late 1930. 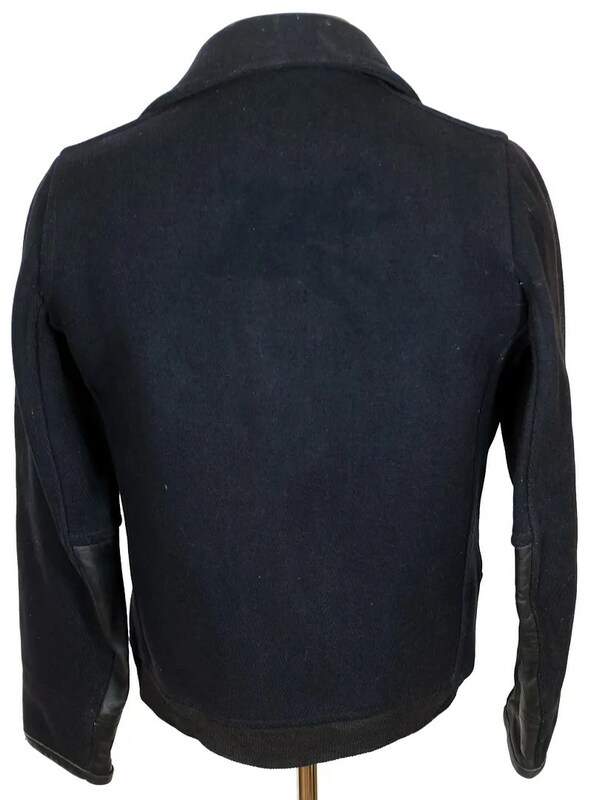 The jacket has Albert Richard’s patented Tu-Length cuffs, which have buttons on either side, allowing them to be worn down for a longer sleeve or turned up and buttoned for a shorter sleeve length. 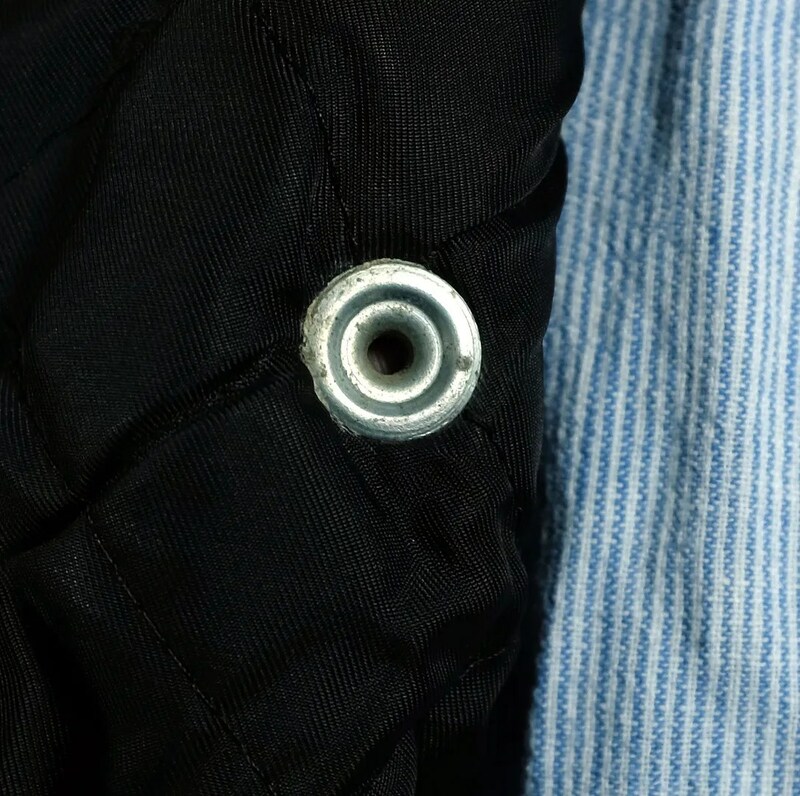 The jacket has a Talon main zipper with a grommet style stopbox. 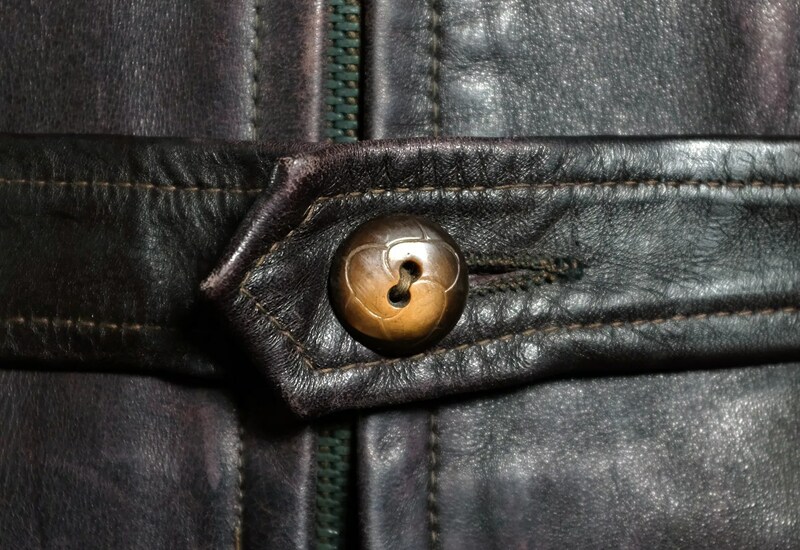 The slider is of the deco sunburst design with oval slider-to-puller connection, which was only produced in the mid 1930s and which was replaced by a simpler design around 1938. 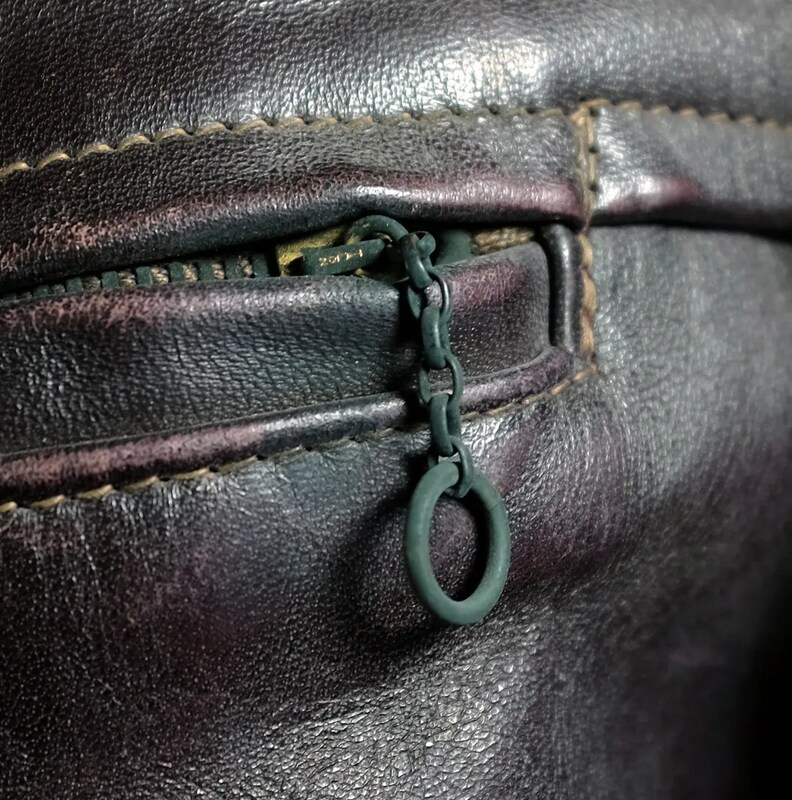 The pull is a rectangular holed, plain backed version, also typical of mid 1930s production. 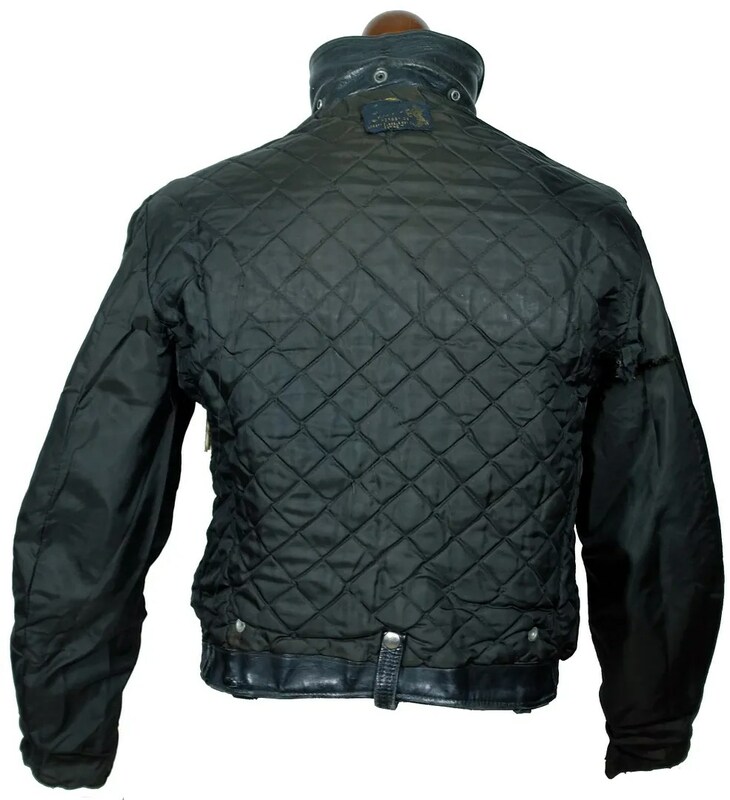 The jacket is lined with plaid wool, with leather pit guards and ventilation grommets. The sleeves have knit storm cuffs to keep out the wind. 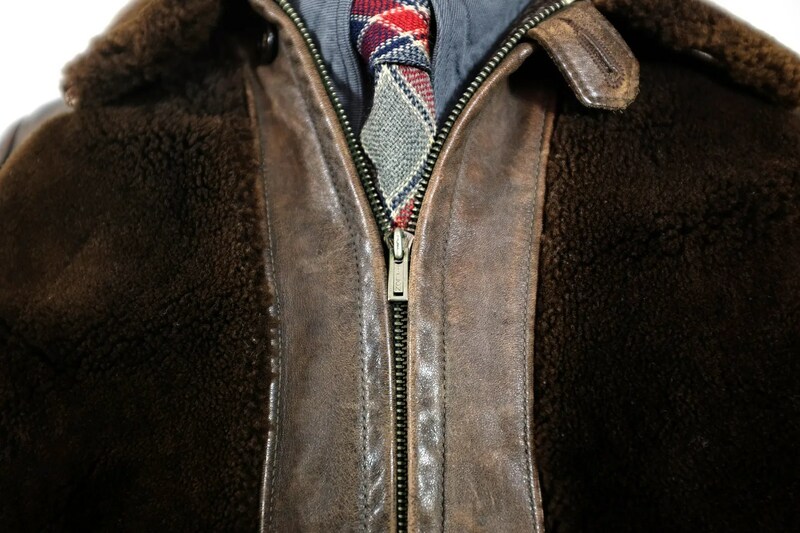 The collar has a buttoned chinstrap throat latch to cinch it up tight in bad weather. 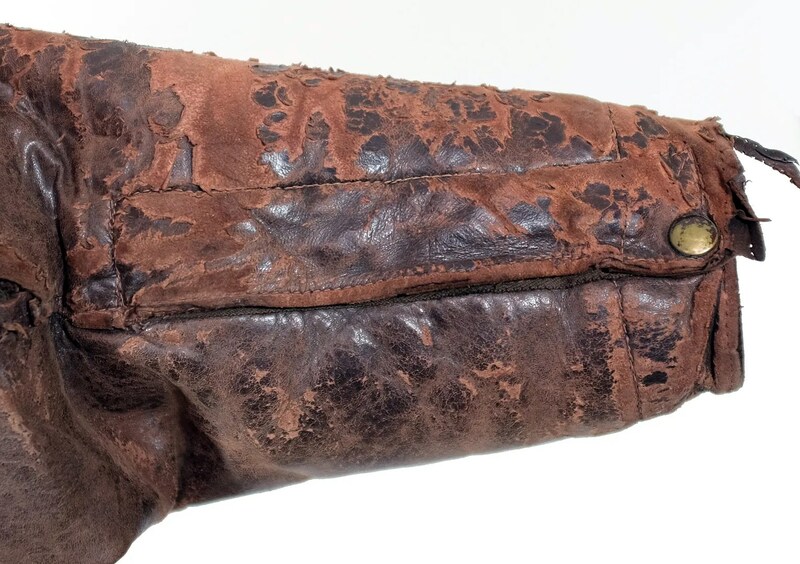 Fried-Ostermann was founded c.1902 as a glove manufacturer. 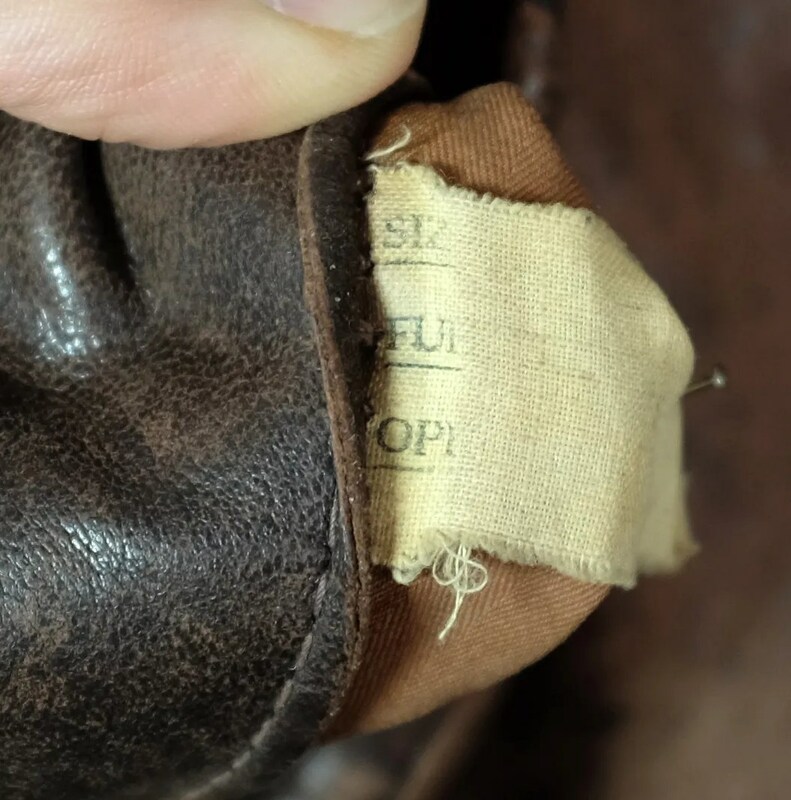 They bought out their competitor, Price Gloves, and relocated production of that company’s products to their original factory, located at 617-645 Reed Street, Milwaukee, WI. 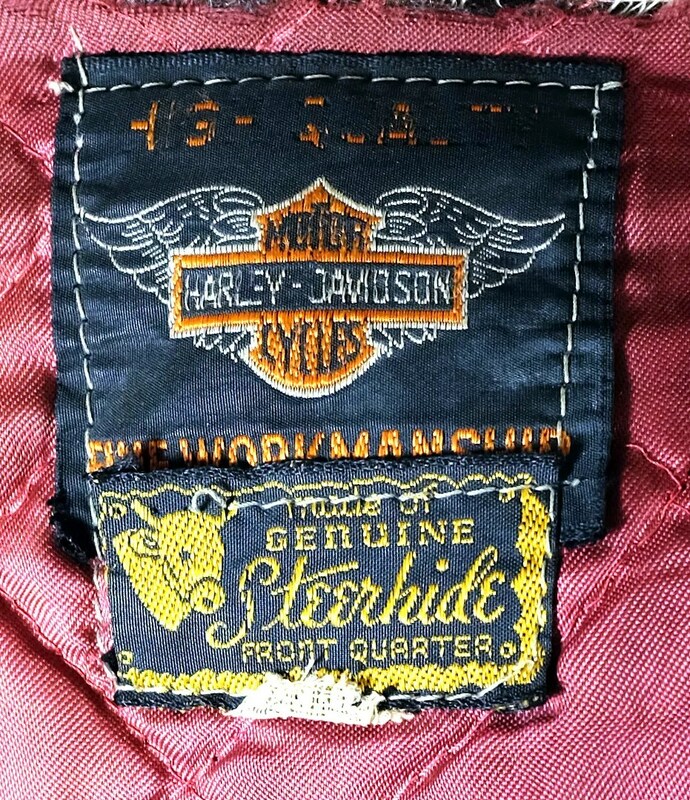 By 1915, the company had gained a partner, and was known as the Fried, Ostermann, Meyer Co, but that looks to only have lasted until 1917. As the company grew, they relocated to 1645 S. 2nd Street, Milwaukee, WI. 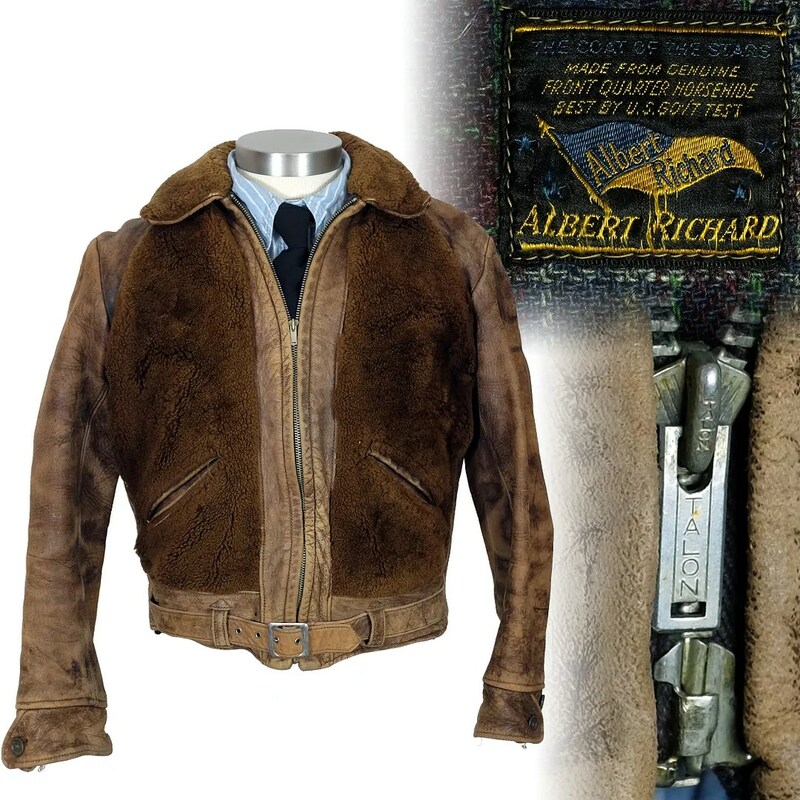 Fried-Ostermann diversified out of gloves and into outerwear in the late 1920s with the formation of a new division of the company, called Albert Richard. 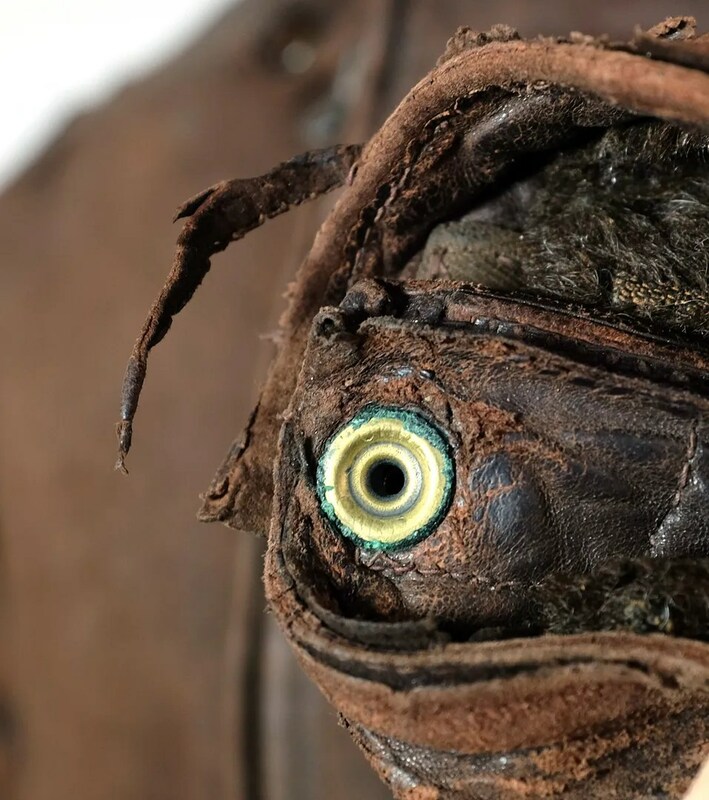 The leather jackets, mackinaws, overcoats and sportswear produced by Albert Richard would soon come to eclipse the glove-making side of the company. Pre-war advertising stressed health and sports, with endorsements from college football players. 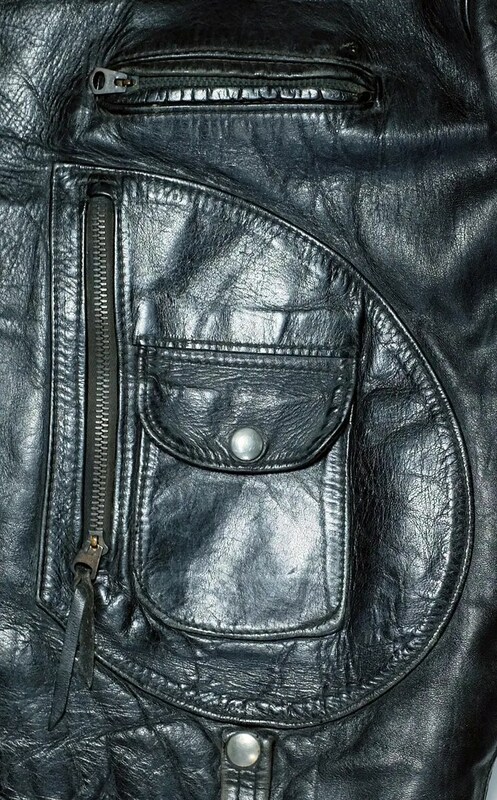 These ads also talk about bringing items of clothing which were previously thought of as workwear, like mackinaws and leather jackets, into the realm of ordinary streetwear, citing their comfort and durability. 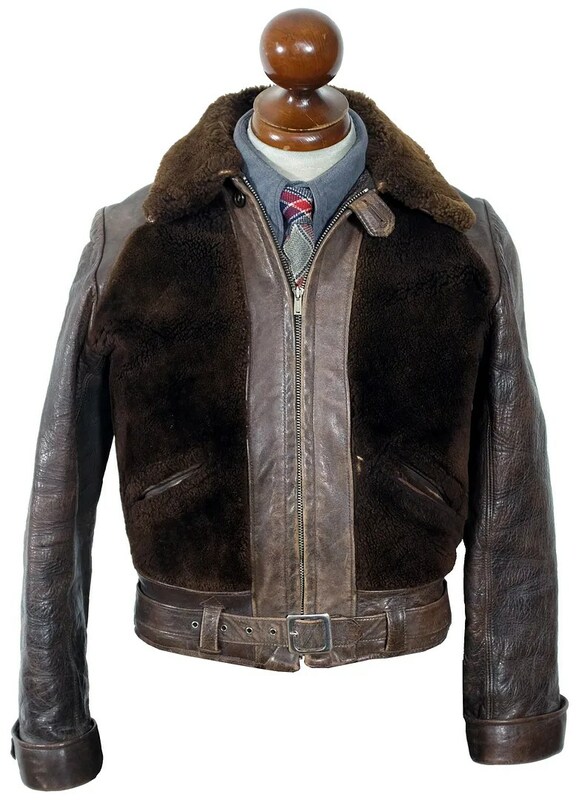 During WWII, the Albert Richard factory made A-2 (contract AC 23383), M-422A (contract 1406A), M444A and M445A flight jackets under the name of their parent company, Fried-Ostermann. 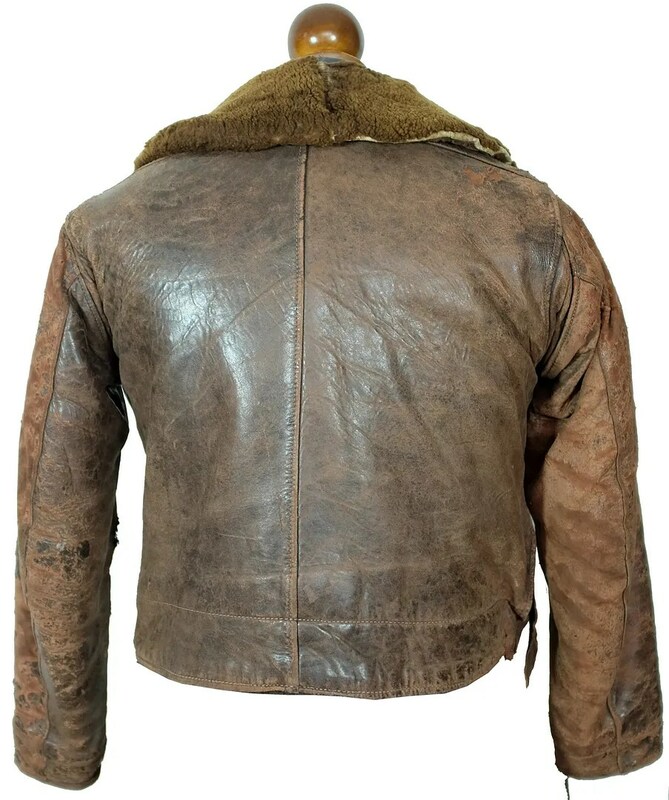 They advertised leather jackets, overcoats and sportswear heavily during WWII, giving their jackets model names like the “Spitfire” and the “Meteor”. During the war, the company gave away wall-sized posters showing a range of american military airplanes. 850 workers were employed by Albert r in 1946, with plans to hire another 400. 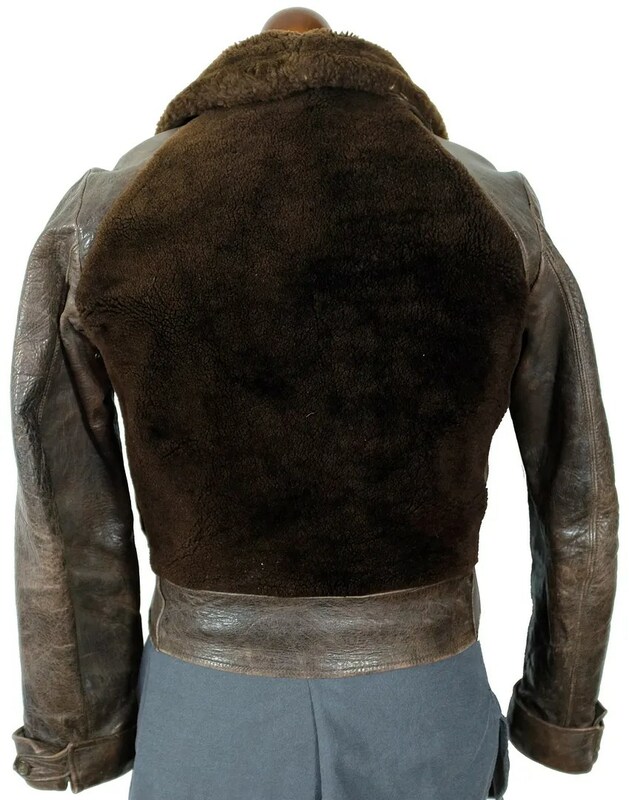 The company was one of the first to use fiberglass insulation in coats, a technology borrowed from b-29 bombers Sheepskin collared “storm coats” became a signature model after the war. President of Fried-Ostermann, Richard Fried, sold their Albert Richard Division to the Drybak corporation of Binghampton, NY in late 1952. 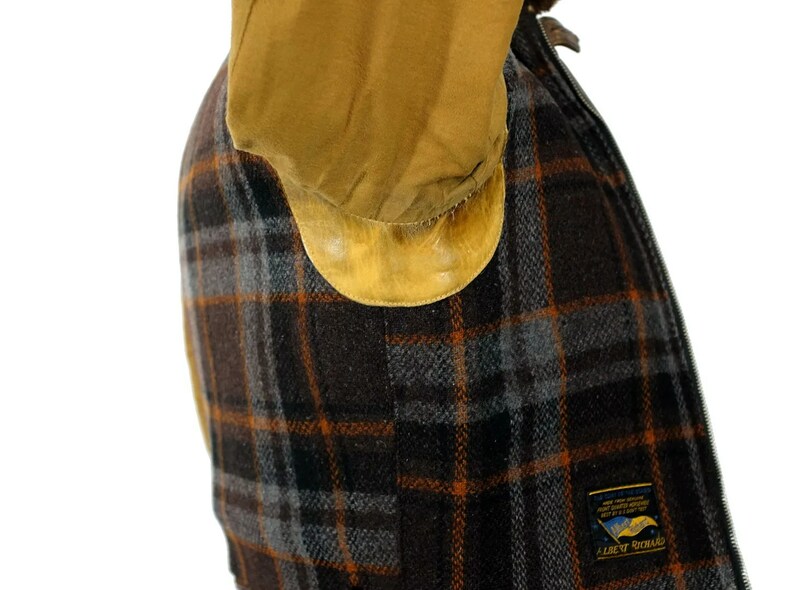 Drybak, a maker of canvas hunting clothing was looking to diversify their line. 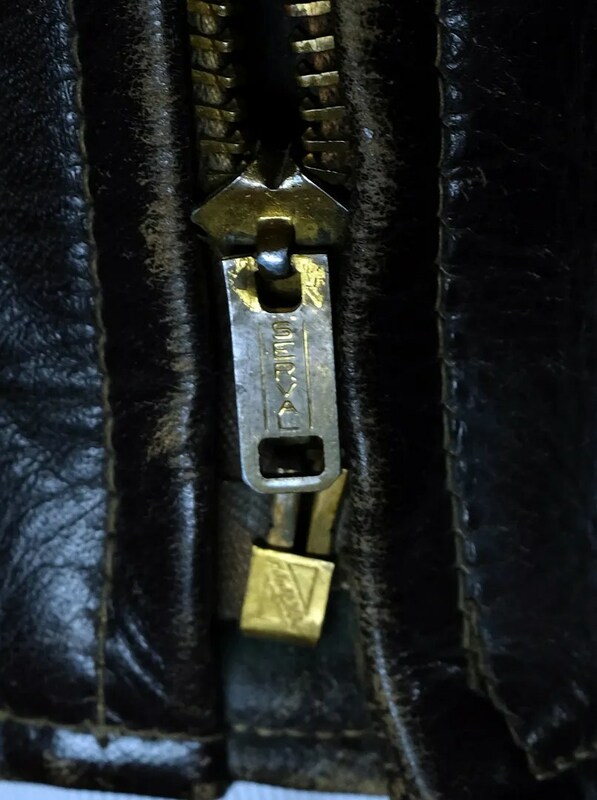 In the deal, they got the licensing, branding, patterns, dealership network, but other than the Vice President and designer for Albert Richard, all of the employees and equipment stayed at the plant in Milwaukee. 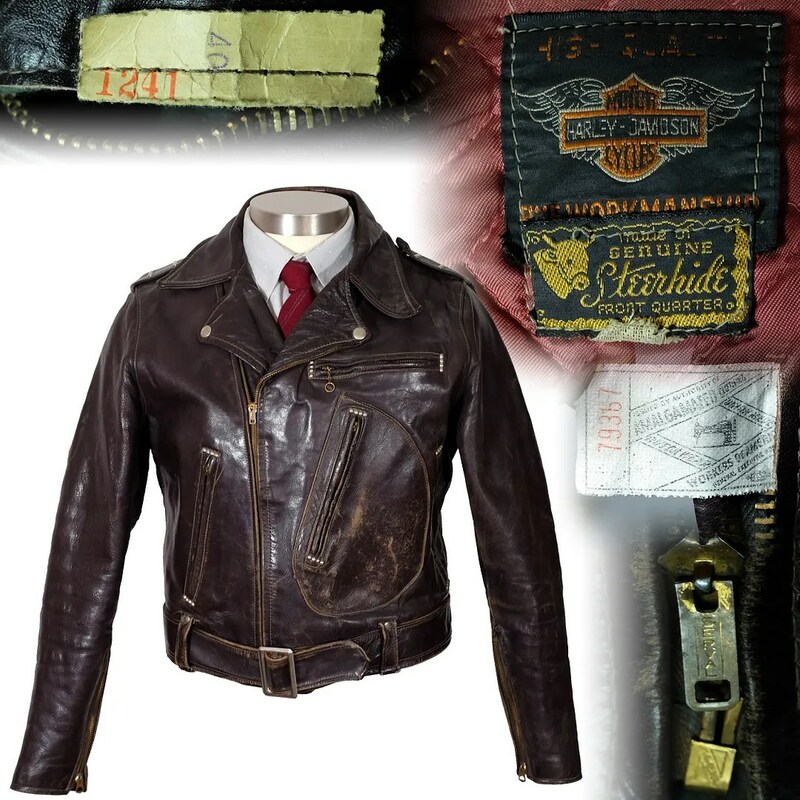 Fried-Osterman re-focused the attention of their plant on the production of gloves, and on producing leather jackets under house labels for mail order and department stores. 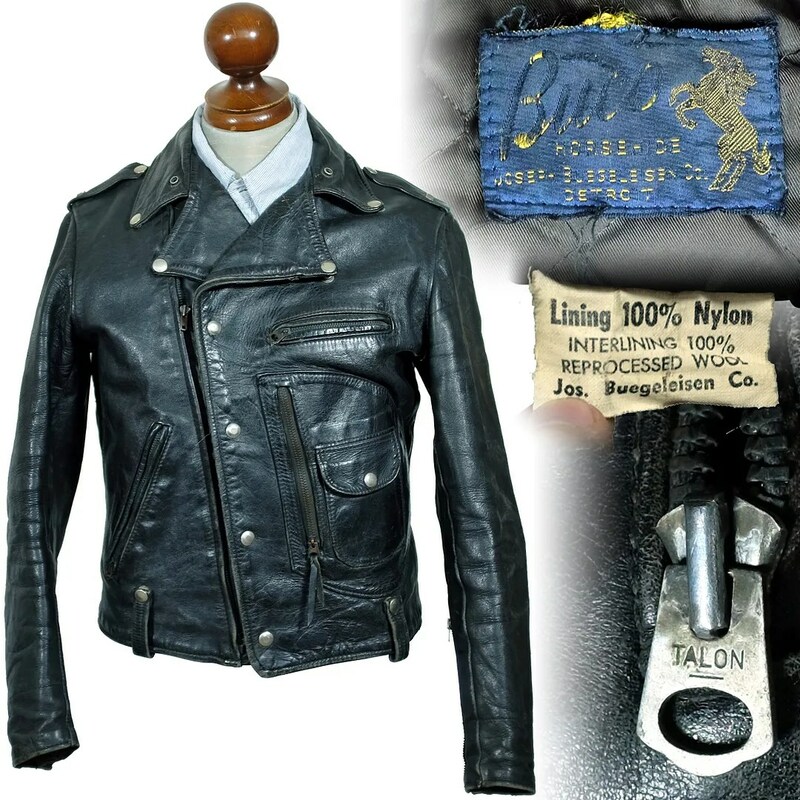 Starting in 1953, under Drybak’s ownership, Albert Richard clothing was once again produced, this time under contract at a factory in New Jersey, which Drybak declined to name. 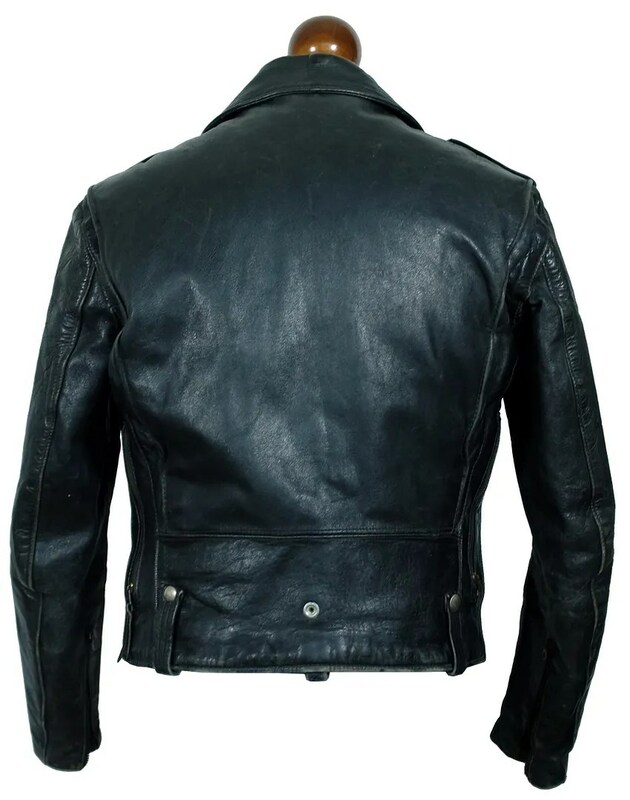 The plan at that time was to have production moved to New York by 1954. 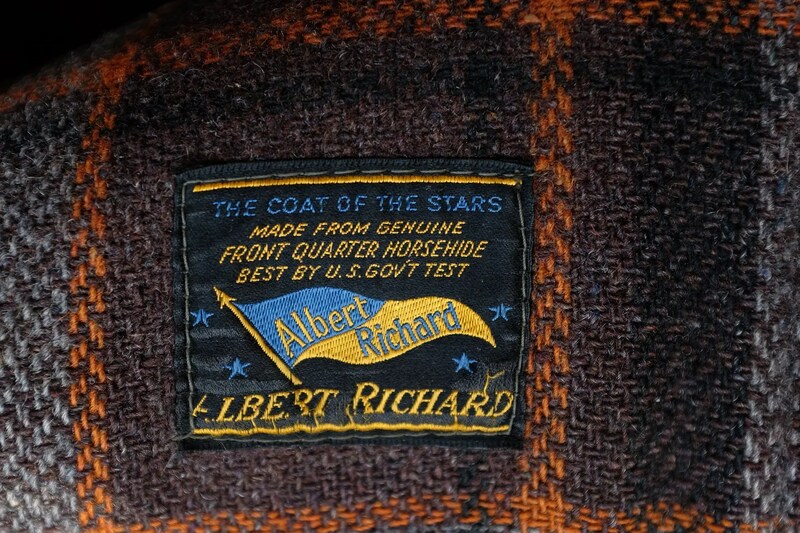 Labels were changed in this period to read “Albert Richard by Drybak”. 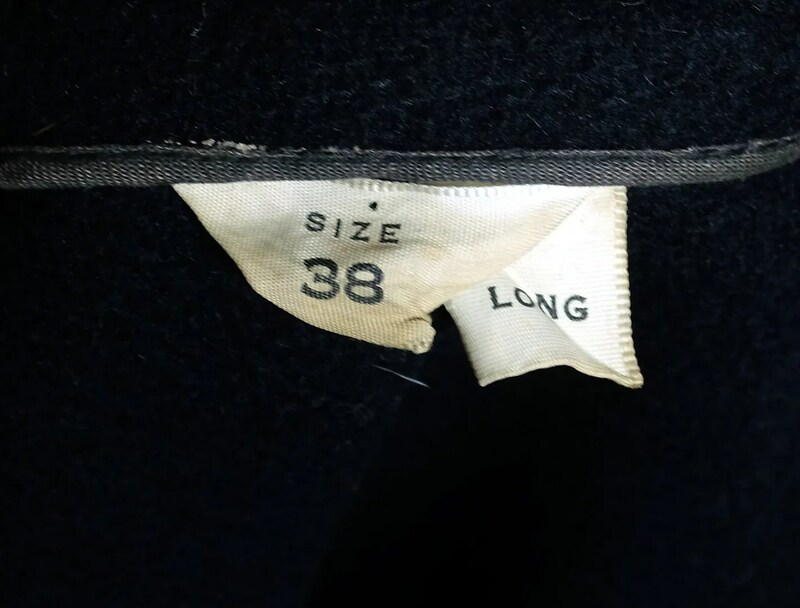 In 1955, Drybak acquired the Martin Mfg. Co. in Martin, TN. 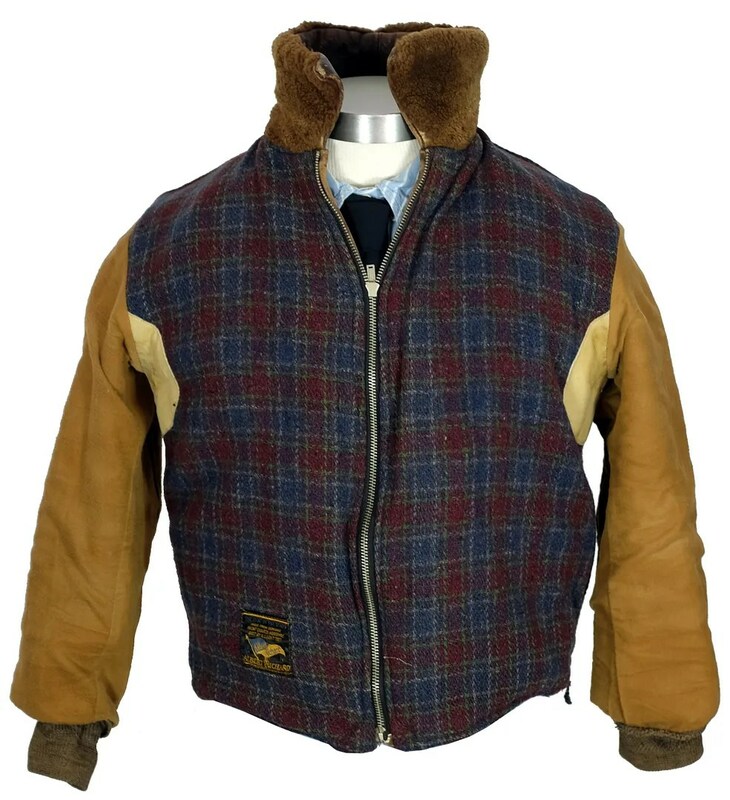 They closed their Binghamton operations in that same year and relocated their hunting clothing manufacturing and their Albert Richard division to the Tennessee plant to take advantage of the lower labor costs in the south. 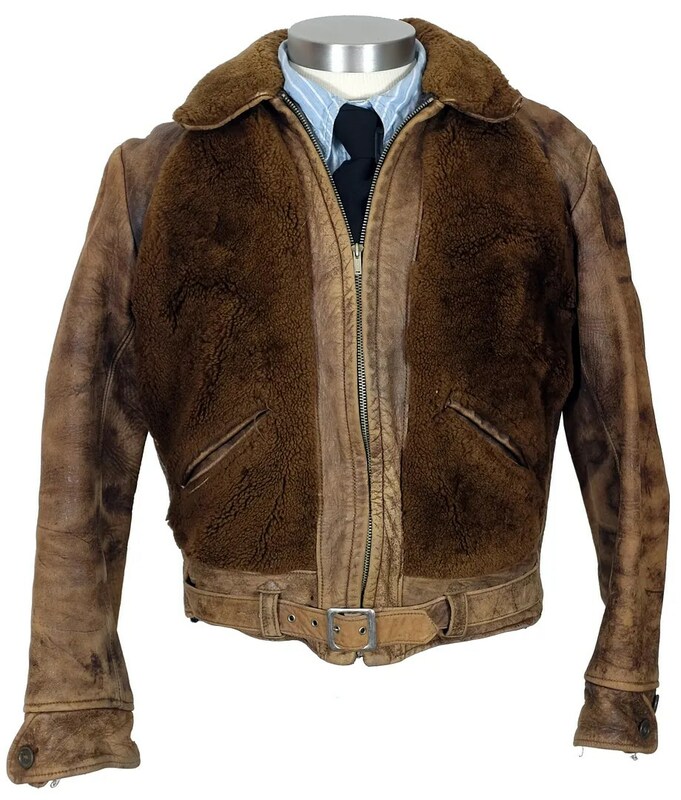 This vintage jacket was made in Kansas City, Missouri, as a civilian version of the US army B-2 Flight jacket, issued in the early 1930s, and replaced by the B-3 in 1934. 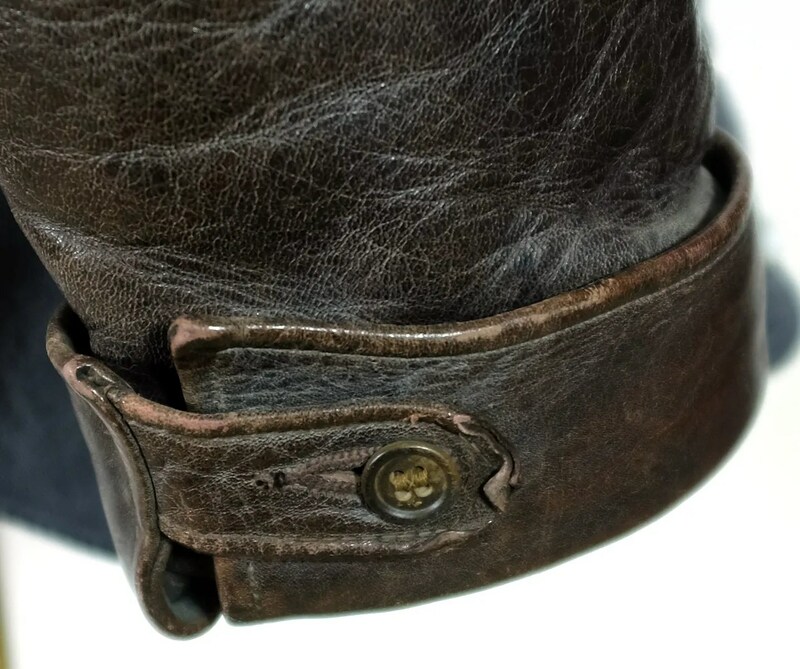 The army version was made of horsehide, with a single breast pocket, attached belt zippered cuffs on the inside of the wrist, and a full alpaca lining and mouton collar. 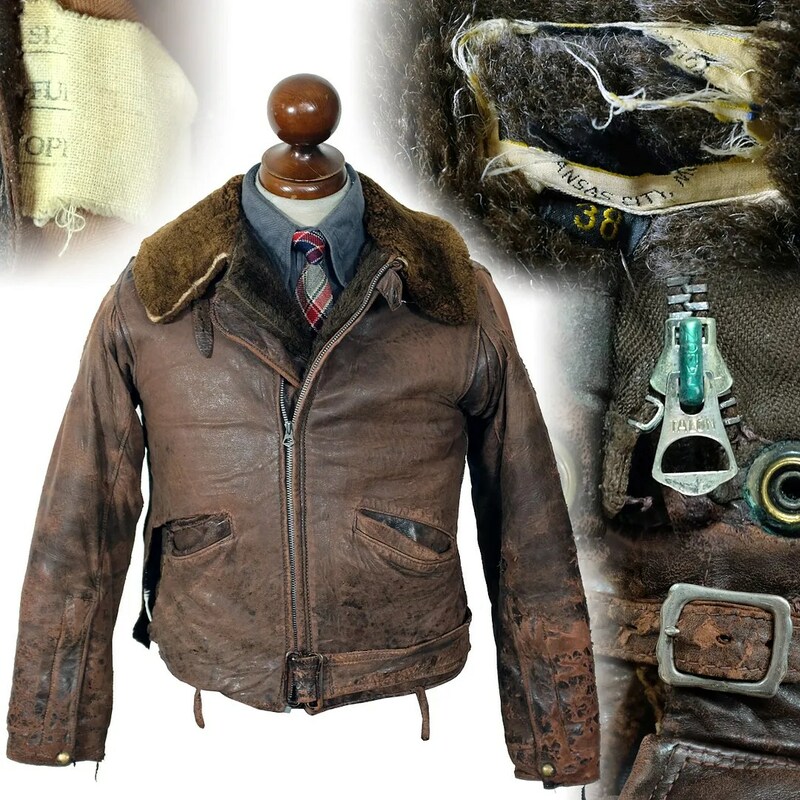 This jacket was produced with a civilian label and a few alterations to the pattern. 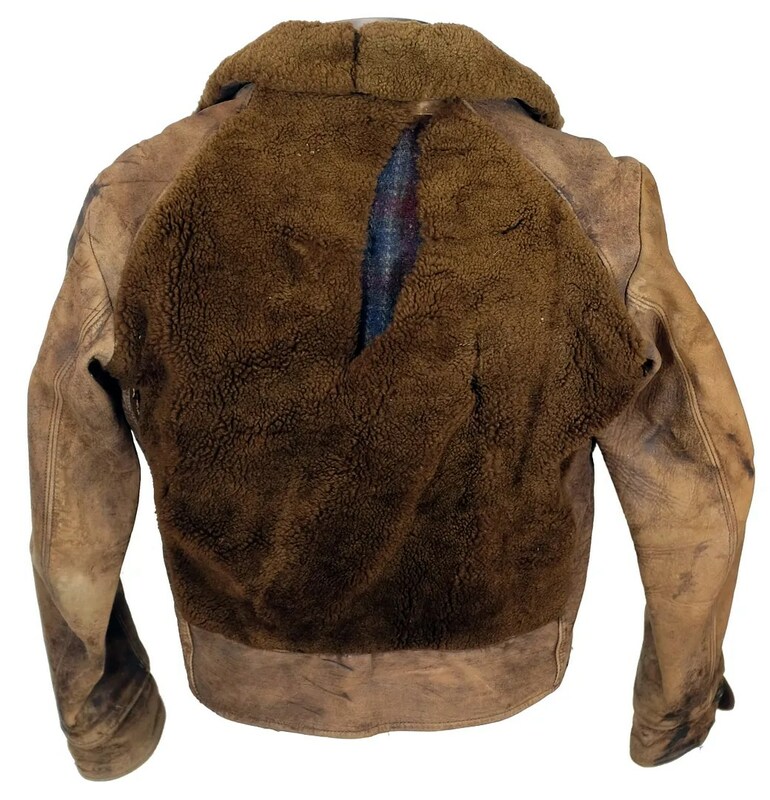 This jacket is made from capeskin, and with handwarmer pockets instead the large breast patch pocket that was universally removed from the army production version. 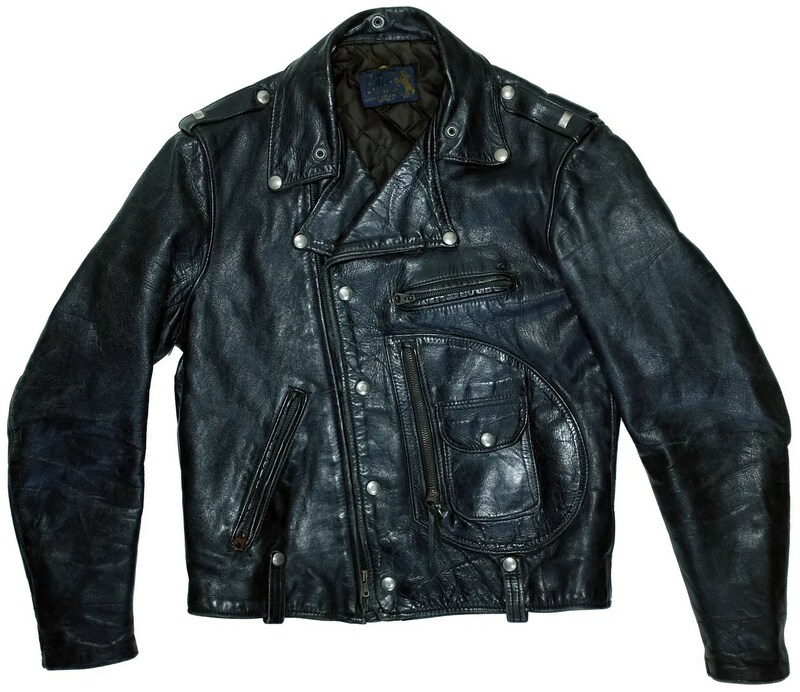 This jacket has an off-center Talon main zipper, with bell-shaped slider and unmarked diagonal-stripe sunburst stopbox. 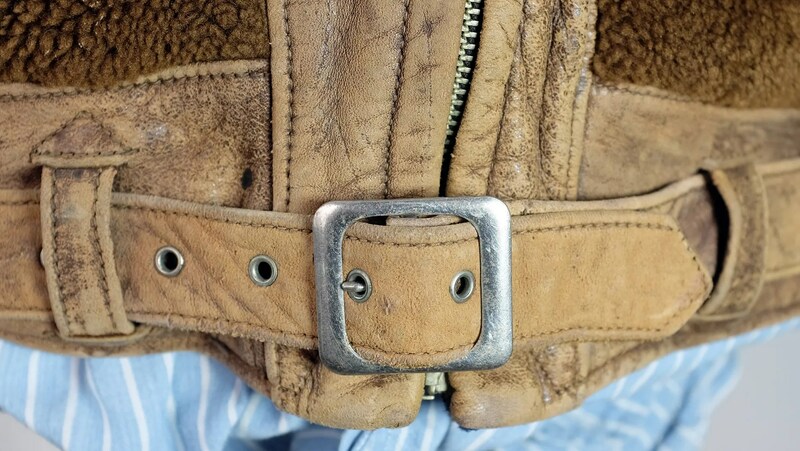 The sleeves have zipper cuffs, with early pattern United Carr snaps and bell shaped talon zippers. 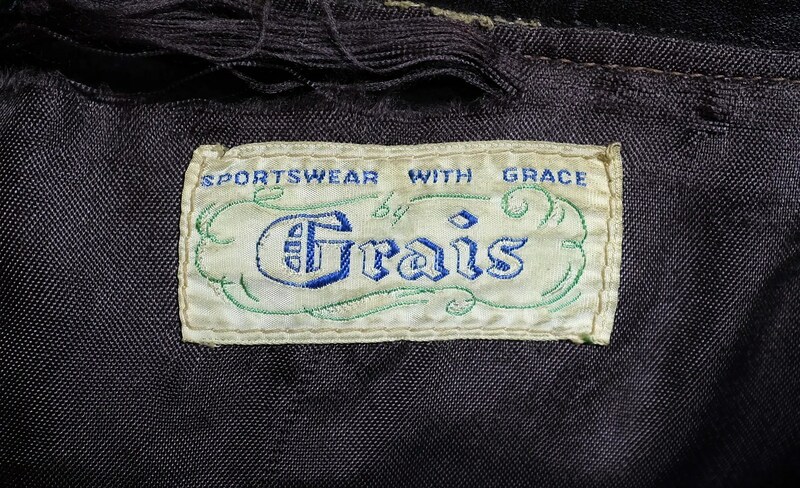 The jacket has heavy wear, and the label has been partially worn away. 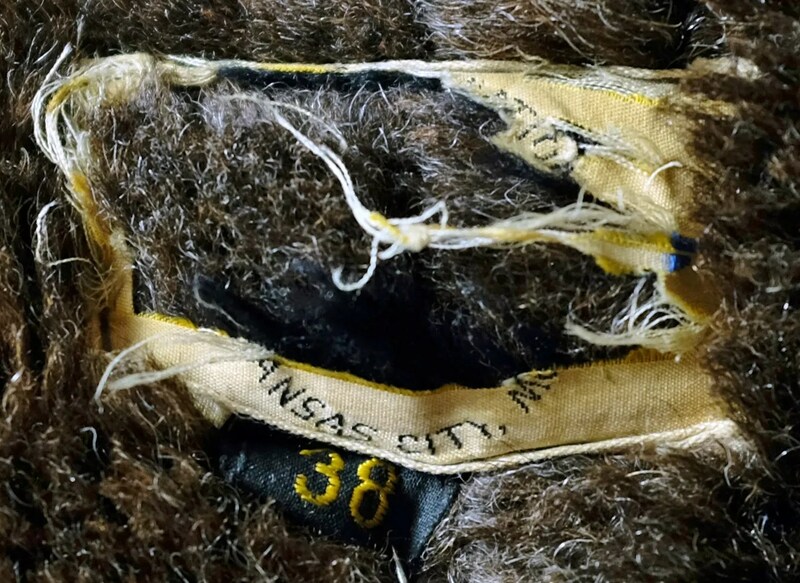 The remaining text reads “aviation” and “Kansas City Mo”. 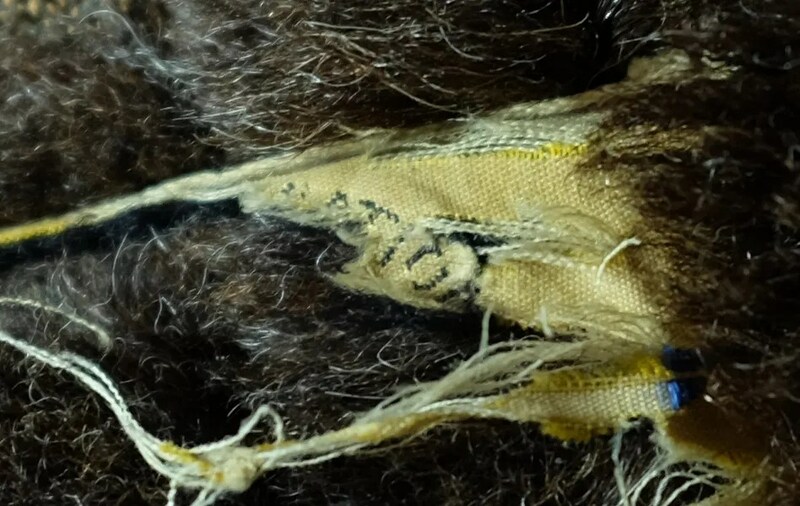 There is a remnant of what looks to be a wing logo. 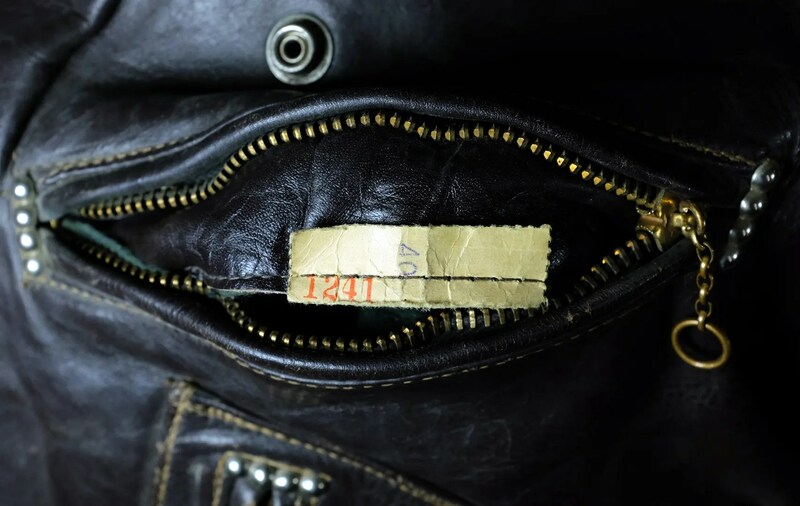 The size tag is of the black and yellow design used on military jackets, and the pocket linings are the distinctive shade of twill used in the linings of A-2 jackets. 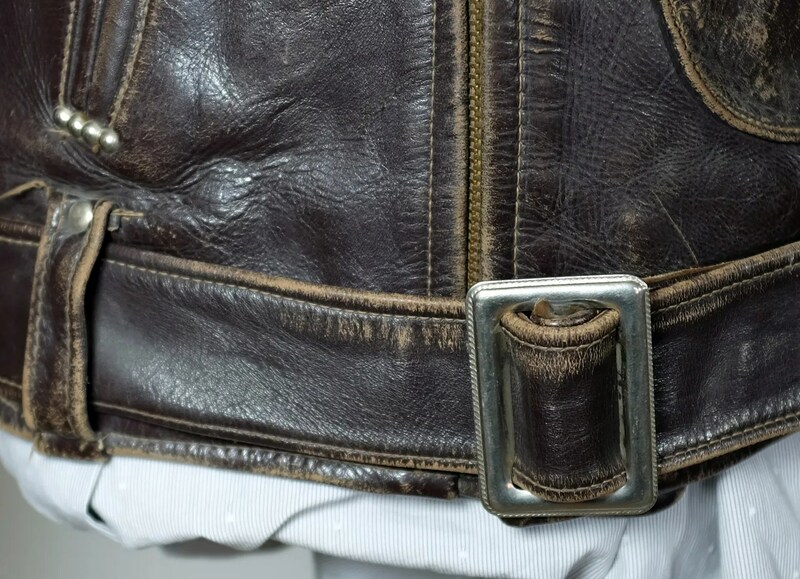 These details point to this jacket having been made as part of a specialized civilian aviator’s line by a manufacturer which held a military jacket contract.